p-크실렌을 방향족 탄화수소(특히는 톨루엔)의 불균화 반응 또는 알킬화 반응에 의하여, 선택적이고도 고수율로 제조할 수 있는 실리케이트 피복 MFI형 제올라이트, 및 실리케이트 피복 MFI형 제올라이트의 제조 방법을 제공한다. Aromatic hydrocarbons, the p- xylene provides a silicate-coated preparation of the MFI-type zeolite, and silicate coated MFI-type zeolite which can be prepared as a disproportionation reaction or an alkylation reaction by the selection of high-yield jeokyigodo (particularly toluene). 본 발명의 실리케이트 피복 MFI형 제올라이트는, MFI형 제올라이트를 실리케이트로 피복한 것으로서, X선 회절 스펙트럼에 있어서 2θ = 7.0∼8.4°에 있는 피크 a와, 2θ = 8.4∼9.7°에 있는 피크 b의 피크 면적비 b/a가 1 이상이고, 또한, 하메트 지시약에 의하여 측정된 pKa 값이 ＋3.3 이상인 것을 특징으로 한다. Silicate coating MFI-type zeolite of the present invention, as the one covered with a MFI-type zeolite as a silicate, X-ray peak b in the 2θ = 7.0~8.4 ° and a peak, 2θ = 8.4~9.7 ° in a diffraction spectrum in the peak characterized in that at least the area ratio b / a is 1 or more and, also, with a pKa value of +3.3 measured by meth indicator. 본 발명은, 실리케이트 피복 MFI형 제올라이트와 그 제조 방법, 및 당해 제올라이트로 이루어지는 촉매를 이용한 방향족 탄화수소, 특히는 톨루엔의 불균화 반응 또는 알킬화 반응으로부터, p-크실렌을 제조하는 방법에 관한 것으로서, 특히는, 고수율로 고순도의 p-크실렌을 제조하는 방법에 관한 것이다. The present invention, silicate coating MFI-type zeolite and a method of manufacturing the same, and relates to an aromatic hydrocarbon with a catalyst comprising the zeolite art, particularly from the disproportionation reaction or an alkylation reaction of toluene, a method for producing a p- xylene, especially to, high yield, to a method for producing a high purity of p- xylene. 방향족 화합물 중에서도 크실렌류는, 폴리에스테르의 원료인 테레프탈산, 이소프탈산, 오르토프탈산 등을 제조하는 출발 원료로서, 매우 중요한 화합물이며, 여러 가지 제조 방법에 의하여 제조되고 있다. Among the aromatic compound is xylene, as a starting material for preparing the raw material such as a polyester of terephthalic acid, isophthalic acid, orthophthalic acid, is a very important compound, there have been manufactured by various manufacturing methods. 그 중에서도 p-크실렌은, 폴리에틸렌테레프탈레이트의 모노머 원료인 테레프탈산의 제조 원료로서 유용해서, 선택적으로 p-크실렌을 제조하는 방법이 여러 가지 제안되어 있다. Among them, p- xylene, it is useful as a raw material for the production of the monomer raw material of terephthalic acid, polyethylene terephthalate, a method for selectively producing a p- xylene and the proposed many ways. 방향족 탄화수소(예를 들면, 톨루엔)로부터 선택적으로 p-크실렌을 제조하기 위하여, MFI형 제올라이트의 분자체 작용(또는 형상 선택성)을 이용하는 것이 검토되고 있는데, 특히 외표면의 처리가 행해져 있지 않은 MFI형 제올라이트에는 세공(細孔) 내부와 외표면에 활성점(산점(酸點))이 존재하여, 세공 내에서 반응이 일어나면 생성물의 분자 사이즈에서 오는 확산 제약에 의하여 형상 선택성이 발현되어 p-크실렌만이 얻어지나, 외표면에서 반응하면 형상 선택성이 없어, 다른 이성체(o-크실렌이나 m-크실렌)도 생성된다. Aromatic hydrocarbons (e.g., toluene), optionally in order to produce p- xylene, molecular sieve action of the MFI-type zeolite (or shape selectivity) for there has been investigated to use, in particular MFI type is not a process carried out from the outer surface zeolite has pores (細孔) to the active sites (acid sites (酸 點)) present in the internal and external surface, a reaction occurs within the pores is the shape selectivity is expressed by the diffusion limitations which comes from the molecular size of the product, p- xylene only When this takes over, from the outer surface it does not have the shape-selective reaction, and also generates other isomers (o- xylene and m- xylene). 또, 세공 내에서 생성한 p-크실렌이 외표면 산점에 접촉함으로써, 이성화되어 o-크실렌이나 m-크실렌이 되는 반응도 일어난다. In addition, by contact with the outside is a p- xylene produced in the pores the surface acid sites, the isomerization reaction takes place that o- xylene and m- xylene. 외표면 처리되어 있지 않은 MFI형 제올라이트에서는, 외표면 반응이 우세하기 때문에, 통상, 생성물은 o-, m-, p-크실렌의 혼합물이 되고, p-크실렌의 선택률은 열역학적 평형의 23% 정도이다. More because the MFI-type zeolite has not been subjected to surface treatment, the outer surface reaction is dominant, usually, the product is a mixture of o-, m-, p- xylene, the selectivity of p- xylene is about 23% of the thermodynamic equilibrium . 즉, p-크실렌만을 선택적으로 얻기 위해서는, MFI형 제올라이트 세공 내의 활성점만이 사용되게 할 필요가 있어, 외표면의 활성점(산점)인 알루미늄을 제거하는 기술, 또는 피복 수식하는 기술이 제안되고 있다. That is, in order to obtain only the p- xylene Optionally the only active sites in the MFI-type zeolite pores, it is necessary to be used, the outer surface of the active sites (acid sites) techniques to remove the aluminum, or coating technology that has been proposed formula have. 특허문헌 1에서는, MFI 구조를 갖는 제 1 제올라이트와, 상기 제 1 제올라이트 상을 적어도 부분적으로 피복하고, MFI 구조를 갖는 제 2 제올라이트를 포함하는 제올라이트 결합 제올라이트 촉매 존재 하에서, 톨루엔과 메틸화제와의 반응에 의하여 p-크실렌을 제조할 수 있다는 것이 개시되어 있다. And Patent Document 1, the first zeolite having a MFI structure, wherein the first zeolite phase under zeolite combined zeolite catalyst comprises a second zeolite having at least partially covered, and the MFI structure, the toluene and the reaction with a methylating agent it is disclosed that can be produced by the p- xylene. 또, 특허문헌 2에서는, ZSM-5로 이루어지는 제 1 다공질 무기 물질을 함유하고, 삼차원 구조를 갖는 매크로 구조체의 외면의 일부를, 실리카라이트로 이루어지는 제 2 다공질 무기 물질로 피복한, 탄화수소 전화(轉化)에 적합한 촉매가 개시되어 있다. Further, Patent Document 2, the first containing the porous inorganic material and covering a portion of the outer surface of the macro structure having a three-dimensional structure, with a second porous inorganic material composed of a silicalite, a hydrocarbon phone (轉化 consisting of ZSM-5 ) and a catalyst is disclosed suitable. 또한, 특허문헌 3에서는, 소정의 결정자 직경을 갖는 MFI형 제올라이트의 외표면을, 소정의 두께의 실리케이트로 수식함으로써, 활성점인 알루미늄을 피복한 촉매가 개시되어 있다. Further, in Patent Document 3, by the equation MFI-type zeolite of the outer surface having a specified crystallite size, in the predetermined thickness of the silicate, it is coated with an aluminum catalyst is disclosed. 또, 불소원을 도입하여 MFI형 제올라이트를 합성하고, 당해 합성한 MFI형 제올라이트를, 불소원과 실리카원과 함께 수열(水熱) 합성하여, MFI형 제올라이트 외표면에 실리케이트 막을 형성한 촉매도 제안되어 있다(비특허문헌 1 참조). In addition, by introducing the fluorine source and the synthesized MFI-type zeolite, also proposed the MFI-type zeolite the art synthesis, by combining a fluorine source and a sequence (水 熱) with the silica source, the catalyst film is formed silicate on the outer surface MFI-type zeolite It is (see non-Patent Document 1). 한편, 특허문헌 4에서는, 소정의 SiO 2 /Al 2 O 3 비 및 1차 입자경을 갖는 MFI형 제올라이트를 결정성 실리케이트로 피복하고, 당해 촉매의 외표면에 존재하는 산점을 하메트 지시약으로 pKa 값을 규정한 촉매가 개시되어 있다. On the other hand, Patent Document 4, a predetermined SiO 2 / Al 2 O 3 ratio and the primary covering the MFI-type zeolite having a particle diameter of a crystalline silicate and, pKa values of acidic sites present on the outer surfaces of the catalyst and meth indicator the catalyst is disclosed as defined for. 상기의 외표면을 수식한 MFI형 제올라이트는, 벤젠 및/또는 톨루엔의 알킬화 반응에 의하여, p-크실렌을 고선택률로 제조하는 것이 가능하다. MFI-type zeolite by the formula wherein the outer surface of the can, it is possible to benzene and / or by the alkylation of toluene, and the p- xylene for producing a selection rate. 그러나, 상기 외표면을 수식한 MFI형 제올라이트에서는, MFI형 제올라이트의 외표면 산점(알루미늄)의 피복이 불충분하기 때문에, 원료 희박 조건 하에서밖에 p-크실렌의 고선택률이 실현되지 않아, p-크실렌 수율이 낮다는 문제가 있었다. However, in the MFI-type zeolite by the formula wherein the outer surface, since the coating of the MFI-type zeolite acid site of the outer surface (aluminum) is insufficient, the high selectivity of p- xylene outside material under lean conditions do not materialize, p- xylene yield this was less a problem. 나아가서는, 상기 외표면을 수식한 MFI형 제올라이트에서는, 원료 희박 조건 하에서밖에 이용할 수 없기 때문에, 톨루엔의 알킬화 반응보다 반응성이 낮은 톨루엔 불균화 반응에 이용한 경우, p-크실렌을 고수율로 제조하기는 곤란해서, 당해 촉매를 사용한 톨루엔 불균화 반응에 의한 p-크실렌 제조는 실용상 적합하지 않았다. Furthermore, the MFI-type zeolite by the formula wherein the outer surface, since it is only available materials under lean conditions, when the reactivities than the alkylation of toluene using a low toluene disproportionation reaction, is made from a high to yield a p- xylene difficult to manufacture p- xylene by toluene disproportionation reaction using the catalyst art is not suitable for practical use. 본 발명은, 상기를 감안하여 이루어진 것으로서, p-크실렌을 방향족 탄화수소, 특히는 톨루엔의 알킬화 반응이나 불균화 반응에 의하여 선택적이고도 고수율로 제조할 수 있는 실리케이트 피복 MFI형 제올라이트, 실리케이트 피복 MFI형 제올라이트의 제조 방법 및 p-크실렌의 제조 방법을 제공하는 것이다. The present invention, been made in view of the above, a p- xylene and the aromatic hydrocarbons, in particular the silicate coating MFI-type zeolites, MFI-type zeolite in the silicate coating and selection jeokyigodo by the alkylation or disproportionation of toluene, the reaction can be produced in a high yield of to provide a method for producing the preparation and p- xylene. 본 발명자들은, 상기 목적을 달성하기 위하여 예의 검토한 결과, 특정 MFI형 제올라이트를 실리케이트로 피복하여 이루어지고, X선 회절 스펙트럼에 있어서 2θ = 7.0∼8.4°에 있는 피크 a와, 2θ = 8.4∼9.7°에 있는 피크 b의 피크 면적비 b/a가 1 이상이고, 또한, 하메트 지시약에 의하여 측정된 pKa 값이 ＋3.3 이상인 당해 실리케이트 피복 MFI형 제올라이트를, 방향족 탄화수소, 특히는 톨루엔 불균화 반응 또는 알킬화 반응에 이용함으로써, 고순도의 p-크실렌을 고수율로 제조할 수 있음을 발견하여, 본 발명을 완성시켰다. The present inventors have intensively studied a result, is made to cover the specific MFI-type zeolite as a silicate, and a peak at 2θ = 7.0~8.4 ° by the X-ray diffraction, 2θ = 8.4~9.7 in order to attain the object with a peak area ratio b / a of a peak at least in b 1 °, also, to the art or more meth the indicator to the pKa value measured by +3.3 silicate coating MFI-type zeolite, an aromatic hydrocarbon, especially toluene disproportionation reaction or by utilizing in the alkylation reaction, and it found that the high purity of p- xylene can be produced in high yield, and completed the present invention. 즉, 본 발명의 실리케이트 피복 MFI형 제올라이트는, MFI형 제올라이트를 실리케이트로 피복한 실리케이트 피복 MFI형 제올라이트로서, 상기 실리케이트 피복 MFI형 제올라이트의 X선 회절 스펙트럼에 있어서, 2θ = 7.0∼8.4°에 있는 피크 a와, 2θ = 8.4∼9.7°에 있는 피크 b의 피크 면적비 b/a가 1 이상이고, 또한, 하메트 지시약에 의하여 측정된 pKa 값이 ＋3.3 이상인 것을 특징으로 한다. That is, the silicate coating MFI-type zeolite of the present invention, the MFI-type zeolite as a silicate coating MFI type zeolite was coated with a silicate, the X-ray diffraction spectrum of the silicate coating MFI-type zeolite, 2θ = peak in 7.0~8.4 ° a and further characterized in that more than 2θ = 8.4~9.7 ° and peak peak area ratio b / a is 1 or more in the b, and, with a pKa value of +3.3 measured by meth indicator. 또, 본 발명의 실리케이트 피복 MFI형 제올라이트는, 상기 발명에 있어서, 실리케이트로 피복 전의 MFI형 제올라이트의 X선 회절 스펙트럼에 있어서, 2θ = 7.0∼8.4°에 있는 피크 a'와, 2θ = 8.4∼9.7°에 있는 피크 b'의 피크 면적비 b'/a'가 1 이상인 것을 특징으로 한다. The silicate coating MFI-type zeolite of the present invention, in the above-described invention, the X-ray diffraction pattern of MFI-type zeolite before coated with silicate, 2θ = peak with a 'in 7.0~8.4 °, 2θ = 8.4~9.7 that a peak b 'of the peak area ratio b' / a 'in the 1 ° or more features. 여기서, 2θ = 7.0∼8.4°와, 2θ = 8.4∼9.7°의 범위에 대해서는, 실리케이트로 피복 후의 MFI형 제올라이트의 피크를 a, b라고 하여, 실리케이트로 피복 전의 MFI형 제올라이트의 피크인 a', b'와 구별하였다. Here, 2θ = 7.0~8.4 ° and, in the range of 2θ = about 8.4~9.7 °, and that the peak of the MFI-type zeolite as a silicate after covering a, b, of a 'peak of the MFI-type zeolite before coated with silicate, b 'and distinguished. 또, 본 발명의 실리케이트 피복 MFI형 제올라이트는, 상기 발명에 있어서, 상기 MFI형 제올라이트의 골격 외의 알루미늄 양은 10% 이하인 것을 특징으로 한다. The silicate coating MFI-type zeolite of the present invention, in the above invention, the other skeleton of the MFI-type zeolite characterized in that the amount of aluminum is less than 10%. 또, 본 발명의 실리케이트 피복 MFI형 제올라이트는, 상기 발명에 있어서, 입자경이 1 ㎛ 이상 40 ㎛ 이하인 것을 특징으로 한다. The silicate coating MFI-type zeolite of the present invention, in the above invention, the particle size is characterized in that less than 1 ㎛ 40 ㎛. 또, 본 발명의 실리케이트 피복 MFI형 제올라이트는, 상기 발명에 있어서, p-크실렌을 방향족 탄화수소, 특히는 톨루엔 불균화 반응 또는 알킬화 반응에 의하여, 선택적으로 제조하기 위하여 이용하는 것을 특징으로 한다. In addition, the silicate coating MFI-type zeolite of the present invention, in the invention, a p- xylene and the aromatic hydrocarbon, in particular is characterized by using the toluene disproportionation reaction or an alkylation reaction, in order to selectively produce. 또, 본 발명의 실리케이트 피복 MFI형 제올라이트의 제조 방법은, 상기 중 어느 하나에 기재된 실리케이트 피복 MFI형 제올라이트를 제조하는 방법으로서, 2θ = 7.0∼8.4°에 있는 피크 a'와, 2θ = 8.4∼9.7°에 있는 피크 b'의 피크 면적비 b'/a'가 1 이상인 MFI형 제올라이트를, 실리카원(源) 및 구조 규정제를 이용하여 수열 합성 처리하여, 상기 MFI형 제올라이트의 외표면에 실리케이트를 성장시키는 것을 특징으로 한다. In addition, the production method of the silicate coating MFI-type zeolite of the present invention is a method for producing a silicate coating MFI-type zeolite according to any one of the above, the peak 2θ = a 'in 7.0~8.4 °, 2θ = 8.4~9.7 peak b in the ° 'peak area ratio of b' / a 'is one or more growth silicate on the outer surface of the MFI-type zeolite to, silica source (源) and structure by the hydrothermal synthesis process using the specified claim, wherein the MFI-type zeolite and it characterized by. 또, 본 발명의 실리케이트 피복 MFI형 제올라이트의 제조 방법은, 상기 발명에 있어서, 실리케이트로 피복 전의 MFI형 제올라이트가, 실리카원과 알루미늄원과 구조 규정제와 불소원을 이용하여 수열 합성 처리하여 얻어지는 것을 특징으로 한다. In addition, the production process of the silicate coating MFI-type zeolite of the invention according to the invention, obtained the type MFI before coated with the zeolite, by using a silica source with an aluminum source and structure provisions of the fluoride source processing hydrothermal synthesis It characterized. 또, 본 발명의 실리케이트 피복 MFI형 제올라이트의 제조 방법은, 상기 발명에 있어서, 상기 MFI형 제올라이트의 골격 외 알루미늄의 제거 공정을 갖는 것을 특징으로 한다. In addition, the production method of the present silicate-coated MFI-type zeolite of the invention according to the invention, characterized by having a removal step of the outer framework aluminum of the MFI-type zeolite. 또, 본 발명의 p-크실렌의 제조 방법은, 상기 중 어느 하나에 기재된 실리케이트 피복 MFI형 제올라이트와 방향족 탄화수소를 접촉시켜, 불균화 반응 또는 알킬화 반응을 행함으로써, p-크실렌을 선택적으로 제조시키는 것을 특징으로 한다. In addition, the production method of the p- xylene of the present invention, by contacting the silicate coating MFI type zeolite and an aromatic hydrocarbon according to any one of the above, performing the disproportionation reaction or an alkylation reaction, for selective production of p- xylene It characterized. 본 발명의 실리케이트 피복 MFI형 제올라이트는, MFI형 제올라이트의 외표면을 불활성의 실리케이트로 피복하고 있기 때문에, MFI형 제올라이트의 분자체 작용(또는 형상 선택성)을 이용하여, p-크실렌을 선택적으로 제조하는 데에, 바람직하게 이용할 수 있다. Silicate coating MFI-type zeolite of the present invention, since the outer surface of the MFI-type zeolite to be coated with the inert silicate, using a molecular sieve action of the MFI-type zeolite (or shape selectivity), for selective production of p- xylene It can be suitably used for the. 특히, 실리케이트 피복 MFI형 제올라이트의 X선 회절 스펙트럼에 있어서, 2θ = 7.0∼8.4°에 있는 피크 a와, 2θ = 8.4∼9.7°에 있는 피크 b의 피크 면적비 b/a가 1 이상이고, 하메트 지시약에 의하여 측정된 pKa 값이 ＋3.3 이상인 것을 이용함으로써, 형상 선택성을 갖지 않는 MFI형 제올라이트 외표면 산점에서의 반응을 억제하여, 방향족 탄화수소, 특히는 톨루엔의 알킬화 또는 톨루엔의 불균화 반응에 있어서 p-크실렌을 선택적이고도 고수율로 제조할 수 있는 제올라이트를 제공할 수 있다. And in particular, a silicate coating MFI-type zeolite of the X-ray diffraction spectrum, a peak with 2θ = in 7.0~8.4 °, the peak area ratio b / a is more than a peak 2θ = b in 8.4~9.7 °, and meth by using not less than the pKa value measured by the indicator +3.3, to inhibit the reaction of the MFI-type zeolite external surface acid sites having no shape selectivity, an aromatic hydrocarbon, in particular, it is in the disproportionation reaction of transalkylation of toluene or toluene select the p- xylene jeokyigodo and it is possible to provide a zeolite which can be prepared in a high yield. 도 1은, 본 발명의 실리케이트 피복 MFI형 제올라이트의 제조 공정의 플로우 차트이다. Figure 1 is a flow chart of the manufacturing process of silicate-coated MFI-type zeolite of the present invention. 도 2는, 합성예 1에 관련된 ZSM-5형 제올라이트의 X선 회절도이다. 2 is a X-ray diffraction chart of the ZSM-5 type zeolite is related to the synthesis example 1. 도 3은, 합성예 2에 관련된 ZSM-5형 제올라이트의 X선 회절도이다. 3 is a X-ray diffraction chart of the ZSM-5 type zeolite is related to the synthesis example 2. 도 4는, 합성예 3에 관련된 ZSM-5형 제올라이트의 X선 회절도이다. 4 is an X-ray diffraction chart of the ZSM-5 type zeolite is related to the synthesis example 3. 도 5는, 합성예 4에 관련된 ZSM-5형 제올라이트의 X선 회절도이다. 5 is an X-ray diffraction chart of the ZSM-5 type zeolite related to Synthesis Example 4. 도 6은, 합성예 5에 관련된 ZSM-5형 제올라이트의 X선 회절도이다. 6 is an X-ray diffraction chart of the ZSM-5 type zeolite is related to the synthesis in Example 5. 도 7은, 합성예 6에 관련된 ZSM-5형 제올라이트의 X선 회절도이다. 7 is a X-ray diffraction chart of the ZSM-5 type zeolite related to Synthesis Example 6. 도 8은, 합성예 7에 관련된 ZSM-5형 제올라이트의 X선 회절도이다. 8 is an X-ray diffraction chart of the ZSM-5 type zeolite is related to the synthesis example 7. 도 9는, 시판 ZSM-5형 제올라이트의 X선 회절도이다. Figure 9, X-rays of a commercially available ZSM-5 type zeolite is a diffraction chart. 도 10은, 실시예 1에 관련된 실리케이트 피복 ZSM-5형 제올라이트의 X선 회절도이다. Figure 10 is, X-rays of the silicate coating ZSM-5 type zeolite in accordance with Example 1, diffraction chart. 도 11은, 실시예 2에 관련된 실리케이트 피복 ZSM-5형 제올라이트의 X선 회절도이다. 11 is, X-rays of the silicate coating ZSM-5 type zeolite in accordance with Example 2 diffraction chart. 도 12는, 실시예 3에 관련된 실리케이트 피복 ZSM-5형 제올라이트의 X선 회절도이다. 12 is an X-ray diffraction diagram of a silicate coating ZSM-5 type zeolite is related to the third embodiment. 도 13은, 실시예 4에 관련된 실리케이트 피복 ZSM-5형 제올라이트의 X선 회절도이다. 13 is an exemplary example 4 coated silicate ZSM-5 X-ray diffraction chart relating to the zeolite. 도 14는, 실시예 5에 관련된 실리케이트 피복 ZSM-5형 제올라이트의 X선 회절도이다. 14 is a silicate coating ZSM-5 X-ray diffraction pattern of the zeolite in accordance with Example 5. 도 15는, 비교예 1에 관련된 실리케이트 피복 ZSM-5형 제올라이트의 X선 회절도이다. 15 is a comparison of X-ray diffraction of the silicate coating ZSM-5 type zeolite related to Example 1. FIG. 도 16은, 비교예 2에 관련된 실리케이트 피복 ZSM-5형 제올라이트의 X선 회절도이다. 16 is a comparative example 2, the silicate coating also X-ray diffraction of the ZSM-5 type zeolite is related to. 도 17은, 비교예 3에 관련된 실리케이트 피복 ZSM-5형 제올라이트의 X선 회절도이다. 17 is a comparison of X-ray diffraction of the silicate coating ZSM-5 type zeolite is related to Example 3, FIG. 본 발명자들은, X선 회절 스펙트럼에 있어서 2θ = 7.0∼8.4°에 있는 피크 a와, 2θ = 8.4∼9.7°에 있는 피크 b의 피크 면적비 b/a가 1 이상이고, 하메트 지시약에 의하여 측정된 pKa 값이 ＋3.3 이상인 실리케이트 피복 MFI형 제올라이트를, 방향족 탄화수소, 특히는 톨루엔의 불균화 반응 또는 알킬화 반응에 이용함으로써, p-크실렌을 고선택률이고도 고수율로 제조할 수 있다는 것을 발견하였다. The present inventors, X-rays and with a peak at 2θ = 7.0~8.4 ° in diffraction, 2θ = peak area ratio of Peak b in 8.4~9.7 ° b / a is more than 1, and measured by the indicator meth the silicate-coated MFI-type zeolite or higher pKa value of +3.3, an aromatic hydrocarbon, in particular, is has been found that by using a disproportionation reaction or an alkylation reaction of toluene, and the p- xylene selectivity and can also be produced in a high yield. 이하에, 본 발명의 실시 형태에 관련된 실리케이트 피복 MFI형 제올라이트 및 당해 실리케이트 피복 MFI형 제올라이트의 제조 방법에 대하여, 도면 등을 참조하여 상세하게 설명한다. In the following, with respect to the silicate coating process for producing a MFI type zeolite and silicate coating art MFI-type zeolite according to an embodiment of the present invention will be described in detail with reference to the drawings. 또한, 이 실시 형태에 의하여 이 발명이 한정되는 것은 아니다. In addition, it is not the invention is not limited by this embodiment. 본 발명의 실리케이트 피복 MFI형 제올라이트는, X선 회절 스펙트럼에 있어서 2θ = 7.0∼8.4°에 있는 피크 a와, 2θ = 8.4∼9.7°에 있는 피크 b의 피크 면적비 b/a가 1 이상이고, 하메트 지시약에 의하여 측정된 pKa 값이 ＋3.3 이상이다. Silicate coating MFI-type zeolite of the present invention, and with a peak at 2θ = 7.0~8.4 ° by the X-ray diffraction, 2θ = peak area ratio of Peak b in 8.4~9.7 ° b / a is more than 1, and is a pKa value of at least +3.3 meth measured by the indicator. 더 바람직하게는, 피크 면적비 b/a가 1.4 이상, 더 바람직하게는 피크 면적비 b/a가 1.9 이상이다. More preferably, the peak area ratio b / a is 1.4 or more, more preferably the peak area ratio b / a is more than 1.9. 피크 면적비 b/a가 1 이상이면, 원료 및 생성물이 확산되기 쉬운 세공이 있는 방향으로 제올라이트 결정의 두께가 상대적으로 얇기 때문에, 반응 속도가 향상하여 p-크실렌을 고수율로 제조할 수 있다. Since the peak area ratio b / a is 1 or higher if the thickness of the zeolite crystals in the direction of the pores tend to be the diffusion material and the product is relatively thin, the increase in the reaction rate and the p- xylene can be produced in a high yield. 그리고, 하메트 지시약에 의하여 측정된 당해 실리케이트 피복 MFI형 제올라이트의 pKa 값이 ＋3.3 이상이기 때문에, 형상 선택성이 없는 외표면 산점이 반응에 불활성인 실리케이트로 덮여 있어, 당해 실리케이트 피복 MFI형 제올라이트를 방향족 탄화수소, 특히는 톨루엔의 불균화 반응 또는 알킬화 반응에 이용하면, p-크실렌을 고선택률로 제조할 수 있다. And, to the art since at least the silicate coating the pKa value of the MFI-type zeolite measured by +3.3 meth indicator, is covered with the shape selectivity of the external surface acid sites it is inert to the reaction without the silicate, the silicate coating art MFI-type zeolite aromatic hydrocarbons, in particular may be used when the disproportionation reaction or an alkylation reaction of toluene, and the p- xylene be made of the selectivity. 본 발명에 있어서, 하기의 조건에 의하여 X선 회절도를 취득하였다. In the present invention, it was obtained a X-ray diffraction chart by the following conditions. 또한, 하기 조건으로 X선 회절도를 취득할 수 있으면 되며, X선 회절 장치를 한정하는 것은 아니다. Further, to be obtained, and if the X-ray diffraction under the conditions, not intended to limit the X-ray diffractometer. 스캔 속도 : 4°/분 Scan speed: 4 ° / min. 본 명세서에 있어서, 피크 면적이란, X선 회절도에 있어서의 피크의 적분 강도를 의미한다. In this specification, the peak areas is, means the integrated intensity of the peak in the X-ray diffraction chart. 실리케이트로 피복한 MFI형 제올라이트의 X선 회절 스펙트럼에 있어서, 2θ = 7.0∼8.4°의 피크를 피크 a, 2θ = 8.4∼9.7°의 피크를 피크 b, 코어가 되는 실리케이트 피복 전의 MFI형 제올라이트(MFI형 제올라이트, 또는 실리케이트 피복 전의 MFI형 제올라이트라고도 함)의 X선 회절 스펙트럼에 있어서, 2θ = 7.0∼8.4°의 피크를 피크 a', 2θ = 8.4∼9.7°의 피크를 피크 b'로 하였다. In an X-ray diffraction pattern of MFI-type zeolite is coated with a silicate, 2θ = 7.0~8.4 ° of the peak to peak a, 2θ = 8.4~9.7 ° peak of the peaks b, the core is coated with silicate prior to MFI-type zeolite (MFI that in the zeolite, silicate or an X-ray diffraction spectrum of the also known as MFI-type zeolite before covering), 2θ = 7.0~8.4 ° was the peak to peak a ', 2θ = peak to peak b of 8.4~9.7 °'. 본 발명의 실리케이트 피복 전의 MFI형 제올라이트는, X선 회절 스펙트럼에 있어서 2θ = 7.0∼8.4°에 있는 피크 a'와, 2θ = 8.4∼9.7°에 있는 피크 b'의 피크 면적비 b'/a'가 1 이상인 것이 바람직하다. Silicate MFI-type zeolite prior to the coating of the present invention provides the X-ray diffraction spectrum 2θ = a peak in the peak area ratio of 7.0~8.4 °, with, peaks 2θ = b in 8.4~9.7 ° 'b' / a 'is not less than 1 are preferred. 더 바람직하게는, 피크 면적비 b'/a'가 2 이상, 더 바람직하게는 피크 면적비 b'/a'가 5 이상, 특히 바람직하게는 피크 면적비 b'/a'가 9 이상이다. More preferably, the peak area ratio b '/ a' is 2 or more, more preferably, the peak area ratio b '/ a' is 5 or more, and particularly preferably the peak area ratio b '/ a' is at least 9. 피크 면적비 b'/a'가 1 이상이면, 원료 및 생성물이 확산되기 쉬운 세공이 있는 방향으로 제올라이트 결정의 두께가 상대적으로 얇기 때문에, MFI형 제올라이트의 외표면을 실리케이트로 피복하더라도, 반응 속도가 거의 저하되지 않아, p-크실렌을 고수율로 제조할 수 있다. Since the peak area ratio b '/ a' is 1 or more when the thickness of the zeolite crystals in the direction of the pores tend to be the diffusion material and the product is relatively thin, as, even if covering the outer surface of the MFI-type zeolite as a silicate, the reaction rate is almost It does not decrease, and the p- xylene can be produced in a high yield. 그리고, 피크 면적비 b'/a'가 1 이상인 MFI형 제올라이트를 실리케이트 피복하면, 실리케이트 막이 외표면에 성장하기 쉽기 때문에, 실리케이트 막이 균일하고도 결함이 거의 없어, 당해 실리케이트 피복 MFI형 제올라이트를 방향족 탄화수소, 특히는 톨루엔의 불균화 반응 또는 알킬화 반응에 이용함으로써, p-크실렌을 고선택률로 제조할 수 있다. Then, the peak area ratio b '/ a' is 1 or more MFI-type when the zeolite silicate coated silicate film is so easy to grow on the outer surface, the silicate film is substantially not uniform and also defects, the art silicate coating MFI-type zeolite, an aromatic hydrocarbon, in particular it may be by using a disproportionation reaction or an alkylation reaction of toluene, and the p- xylene be made of the selectivity. 본 발명의 실리케이트 피복 전의 MFI형 제올라이트는, ZSM-5, TS-1, TSZ, SSI-10, USC-4, NU-4 등을 바람직하게 사용할 수 있고, 특히 바람직한 것은 ZSM-5이다. Silicate MFI-type zeolite prior to the coating of the present invention is ZSM-5, TS-1, TSZ, SSI-10, USC-4, NU-4, and can be preferably used and the like, especially preferred is ZSM-5. 이들 MFI형 제올라이트는, 세공의 크기가 p-크실렌 분자의 짧은 직경과 같은 크기(약 0.55 ㎚)이기 때문에, p-크실렌과, p-크실렌보다 분자사이즈가 조금 큰 o-크실렌이나 m-크실렌을 구별할 수 있어, 목적하는 p-크실렌의 제조에 특히 유효하다. The MFI-type zeolite, the size of the pores since the size (about 0.55 ㎚), such as a short diameter of p- xylene molecules, and the p- xylene, p- xylene molecular size a little larger than the o- xylene and m- xylene can be distinguished, it is particularly effective in producing the desired p- xylene to. 또, 본 발명의 실리케이트 피복 전의 MFI형 제올라이트의 실리카/알루미나 비(SiO 2 /Al 2 O 3 몰비)는, 24 이상 500 이하가 바람직하고, 24 이상 100 이하가 더 바람직하며, 24 이상 70 이하가 더 바람직하다. In addition, the silicate silica / the MFI-type zeolite before covering alumina ratio (SiO 2 / Al 2 O 3 molar ratio) according to the present invention, not more than more than 24 to 500 are preferred, more preferably less than 24 100, 24 70 or less it is more preferred. MFI 구조를 안정적으로 유지하기 위하여, 실리카/알루미나 비는 24 이상인 것이 바람직하고, 반응 활성점인 산량(酸量)(알루미늄)을 유지하기 위하여, 실리카/알루미나 비는 500 이하인 것이 바람직하다. In order to maintain a stable MFI structure, a silica / alumina ratio is preferably 24 is preferred, and the reaction active points in order to maintain the acid amount (酸 量) (aluminum), the silica / alumina ratio is less than or equal to 500 or more. 본 발명의 실리케이트 피복 MFI형 제올라이트는, MFI형 제올라이트의 외표면을 실리케이트로 피복하여 이루어진다. Silicate coating MFI-type zeolite of the present invention, is made to cover the outer surface of the MFI-type zeolite as a silicate. 실리케이트는 비정질이어도 되나, 바람직하게는 결정질(구체적으로는, 결정성 실리케이트 등을 들 수 있음)이고, 더 바람직하게는 코어가 되는 MFI형 제올라이트와 동류의 결정 구조를 갖고, 또한 세공이 연층(連層)되어 있는 결정성 실리케이트(구체적으로는, 실리카라이트 등을 들 수 있음)이다. Silicate, but may be amorphous, preferably crystalline, and (specifically, the crystallinity may be mentioned a silicate, etc. ), more preferably has a crystal structure of the MFI-type zeolite and the like that are the core, and pores are yeoncheung (連層) it is a crystalline silicate (in particular, is that include silicalite, and so on). 실리케이트가 MFI형 제올라이트와 동류의 결정 구조이고, 또한 세공이 연층되어 있으면, 반응장인 MFI형 제올라이트의 세공을 막기 어렵기 때문에, 제올라이트 입자 내의 원료나 생성물 등의 확산이 저해되지 않아, 비정질 실리케이트로 피복한 경우와 비교하여, 반응의 전화율이 향상되는 경향에 있다. A silicate crystal structure of the MFI-type zeolite and the like, and pores If yeoncheung, the reaction since it is difficult to prevent the pores of the artisan MFI-type zeolite, the diffusion of raw materials and products in the zeolite particles does not inhibited, coated with an amorphous silicate in comparison with the case, there is a tendency that the degree of conversion of the reaction is improved. 또한, 상기 실리케이트는, 방향족 탄화수소(특히는 톨루엔)의 알킬화 반응 및 불균화 반응에 있어서 불활성인 것이 바람직하고, 알루미늄을 포함하지 않는 순(純) 실리카인 것이 바람직하다. In addition, the silicate, the aromatic hydrocarbon is preferably in the order of (純) silica in the alkylation and disproportionation reactions (particularly toluene) that does not contain aluminum preferably in an inert, and. 본 발명의 실리케이트 피복 MFI형 제올라이트는, X선 회절 스펙트럼에 있어서, 2θ = 7.0∼8.4°에 있는 피크 a와, 2θ = 8.4∼9.7°에 있는 피크 b의 피크 면적비 b/a가 1 이상이다. Silicate coating MFI-type zeolite of the present invention provides the X-ray diffraction spectrum, and a peak 2θ = a in 7.0~8.4 °, more than the peak area ratio b / a of a peak b 1 in the 2θ = 8.4~9.7 °. 피크 면적비 b/a가 이러한 범위 내의 실리케이트 피복 MFI형 제올라이트는, 실리케이트 막이 균일하고도 결함이 거의 없어, 당해 실리케이트 피복 MFI형 제올라이트를 방향족 탄화수소, 특히는 톨루엔의 불균화 반응 또는 알킬화 반응에 이용함으로써, p-크실렌을 고선택률이고도 고수율로 제조할 수 있다. Silicate coating MFI-type zeolite in the peak area ratio b / a has such a range, the silicate film is substantially not uniform and also the defect, by using the art silicate coating MFI type zeolite is an aromatic hydrocarbon, in particular, is a disproportionation reaction or an alkylation reaction of toluene, and the p- xylene selectivity and can also be produced in a high yield. 본 발명의 실리케이트 피복 MFI형 제올라이트는, 하메트 지시약에 의하여 측정된 pKa 값이 ＋3.3 이상인 것이 특히 바람직하다. Silicate coating MFI-type zeolite of the present invention is particularly preferably not less than, and the pKa value of +3.3 measured by meth indicator. 실리케이트 피복 MFI형 제올라이트의 pKa 값이 ＋3.3 이상이면, 외표면에서의 방향족 탄화수소의 불균화 반응, 알킬화 반응 및 이성화 반응에 불활성이어서, 형상 선택적 반응을 효율적으로 행할 수 있다. If the silicate-coated pKa value of the MFI-type zeolite is more than +3.3, then inert to the disproportionation reaction, transalkylation reaction and isomerization reaction of aromatic hydrocarbons in the outer surface, it is possible to shape selective reaction efficiently. 본 발명의 실리케이트 피복 MFI형 제올라이트의 코어의 제올라이트 부분의 실리카/알루미나 비(SiO 2 /Al 2 O 3 몰비)는, MFI형 구조가 유지되는 범위로 한정되는 일은 없으나, 24 이상 500 이하가 바람직하고, 24 이상 100 이하가 더 바람직하며, 24 이상 70 이하가 더 바람직하다. The silicate-coated silica / alumina ratio of the zeolite portion of the MFI-type zeolite core of the invention (SiO 2 / Al 2 O 3 molar ratio) is, but what is not limited to the range of the MFI structure can be maintained, and is more than 24 to 500 preferably , more preferably less than 24 100 and more preferably 24 or more 70 or less. MFI 구조를 안정적으로 유지하기 위하여, 실리카/알루미나 비는 24 이상인 것이 바람직하고, 반응 활성점인 산량(알루미늄)을 유지하기 위하여, 실리카/알루미나 비는 500 이하인 것이 바람직하다. In order to maintain a stable MFI structure, a silica / alumina ratio is preferably silica / alumina ratio is less than 500 to not less than 24, and preferably maintain the reaction active points in an acid amount (aluminum). 하메트 지시약에 의한 pKa 값은, 산 및 염기의 강도를 나타내는 지표이며, 일반적인 해설이나 측정법에 대해서는 서적에 상세하게 기재되어 있다. And pKa value of the indicator is mat, a measure of the strength of the acid and the base, for a general description or the measuring method is described in detail in publications. 즉, pKa 값이 ＋7.0을 중성으로 하여, ＋7.0보다 큰 값일수록 염기 강도가 강한 것을 나타내고, ＋7.0보다 작은 값일수록 산 강도가 강한 것을 의미한다. That is, the pKa value of +7.0 to neutral, the more a value greater than +7.0 indicates that the base intensity is high, the more a value less than +7.0 means that the acid strength stronger. 본 발명에 있어서의 구체적인 pKa 값의 측정은, 분광 측색계를 이용해도 된다. Measurement of the specific pKa value in the present invention, may be used for spectral color system side. 구체적으로는, 소정 농도의 하메트 시약 탈수 벤젠 용액(각 농도를 표 1에 나타냄) 7 ㎖에, 0.25 g의 실리케이트 피복 MFI형 제올라이트를 첨가하여, 실리케이트 피복 MFI형 제올라이트의 색의 변화, 즉 하메트 지시약의 변색에 따른 착색의 정도를 분광 측색계를 이용하여 판정함으로써 실시된다. Specifically, and meth reagent dehydrated benzene solution with a predetermined concentration (representing the respective concentrations shown in Table 1) to the 7 ㎖, the addition of 0.25 g of the silicate coating MFI-type zeolite, silicate coating change of the color of the MFI-type zeolite, that is to the degree of coloring in accordance with the color change indicator of the mat is carried out by determining, using a spectral color system side. 여기서, 색의 변화(착색의 정도)의 관찰은, 일본공업규격 JIS Z 8729로 정의되는 L*a*b* 표색계에 있어서, 좌표 a*, b*의 값을 분광 측색계로 측정하여 행한다. Here, the observation of the change in color (degree of coloring), in the L * a * b * color system as defined in Japanese Industrial Standard JIS Z 8729, is carried out by measuring the value of the coordinates a *, b * in the spectral side color system. 본 발명에 있어서의 pKa 값의 측정에 사용되는 하메트 지시약은, 2,4-디니트로톨루엔(pKa : －13.75), p-니트로톨루엔(pKa : －11.35), 안트라퀴논(pKa : －8.2), 벤잘아세토페논(pKa : －5.6), 디신남알아세톤(pKa : －3.0), 벤젠아조디페닐아민(pKa : ＋1.5), p-디메틸아미노아조벤젠(pKa : ＋3.3), 4-(페닐아조)-1-나프틸아민(pKa : ＋4.0), 메틸레드(pKa : ＋4.8), 뉴트럴레드(pKa : ＋6.8) 등이다. And meth indicator that is used for measurement of the pKa values ​​in the present invention, 2,4-dinitrotoluene (pKa: -13.75), p- nitrotoluene (pKa: -11.35), anthraquinone (pKa: -8.2) , benzalkonium acetophenone (pKa: -5.6), di-cinnamic al acetone (pKa: -3.0), benzene ah Jody phenylamine (pKa: +1.5), p- dimethylamino azobenzene (pKa: +3.3), 4- (phenylazo) -1-naphthylamine the like: (pKa +6.8) (pKa:: +4.0), methyl red (pKa +4.8), neutral red. 이들 하메트 지시약은, MFI형 제올라이트의 세공 내에 들어가지 않는 크기의 분자이기 때문에, 제올라이트 외표면에 존재하는 산점과만 반응하여, 변색된다. These and meth indicator is, since the size does not fit within the pores of MFI-type zeolite molecule, it reacts only with the acid sites existing on the external surface of zeolite and is discolored. 제올라이트가 하메트 지시약을 변색하였다(제올라이트가 착색되었다)고 판단하는 지표는, 하메트 지시약을 변색하지 않는 고순도 실리카(도소 실리카 제, 닙젤 AZ-200)를, 표 1에 나타낸 각 하메트 지시약 용액에 첨가하였을 때의 색과 당해 제올라이트와의 색차(△a* 혹은 △b*)가 표 1에 나타낸 값이 되었을 때이다. Was zeolite discoloration doing meth indicator (zeolite was colored) and determine indicator, and meth high purity silica that do not discolor the indicator (Tosoh Silica claim, nipjel AZ-200), each child meth indicator solution showing an, in Table 1 for the color difference (△ a * or △ b *) of the color of the art the addition of zeolite to the when the value shown in Table 1. 표 1은 하메트 지시약의 착색 판단 지표이다. Table 1 is a judgment index of the colored indicator with meth. 또한, 이 착색의 판정에 있어서, pKa가 X의 하메트 지시약을 변색하여, 제올라이트가 착색된 경우, 당해 제올라이트의 pKa 값을 X 미만이라고 판정하고, pKa가 Y의 하메트 지시약을 변색하지 않는 경우, 당해 제올라이트의 pKa 값을 Y 이상이라고 판정한다. Further, when judged in the judgment of the colored, the color transfer to and meth indicator of pKa of X, if the zeolite is colored, the pKa value of that zeolite, and determined to be less than X, a pKa of not discolor the down meth indicator of Y and a pKa value of such zeolites is determined that more than Y. 따라서, 하메트 지시약에 의하여 측정된 pKa 값이 ＋3.3 이상이란, p-디메틸아미노아조벤젠(pKa : ＋3.3)을 변색하지 않는 것을 의미한다. Thus, with more than a pKa value of +3.3 measured by meth indicator is, p- dimethylamino azobenzene: means that do not discolor the (pKa +3.3). 본 발명의 실리케이트 피복 MFI형 제올라이트는, X선 회절 스펙트럼에 있어서, 2θ = 7.0∼8.4°의 피크 a와, 2θ = 8.4∼9.7°의 피크 b의 면적비 b/a가 1 이상이고, 또한, 하메트 지시약에 의하여 측정된 pKa 값이 ＋3.3 이상을 만족시키기만 하면, 제조법은 특별히 한정되지 않으나, 예를 들면, 이하의 실리케이트 피복 MFI형 제올라이트의 제조 방법을 바람직하게 들 수 있다. And in the silicate coating MFI-type zeolites, X-ray diffraction spectrum of the present invention, and 2θ = 7.0~8.4 ° of a peak, 2θ = area ratio of the peak 8.4~9.7 ° b b / a is 1 or larger, and When meth only to satisfy at least the pKa value measured by the indicator +3.3, production method is not particularly limited, and for example, there may be mentioned a method for producing a silicate coating than MFI-type zeolite preferably used. 본 발명의 실리케이트 피복 MFI형 제올라이트에 관련된 제조 방법에 있어서, 코어가 되는 MFI형 제올라이트는 테트라프로필암모늄 브로마이드(TPABr)나, 테트라프로필암모늄 히드록시드(TPAOH), 테트라에틸암모늄 히드록시드 등의 구조 규정제를 사용하여 결정화하는 것이 바람직하고, 그 중에서도 테트라프로필암모늄 브로마이드(TPABr)를 구조 규정제로서 사용하는 것이 더 바람직하다. Structure in the manufacturing method related to the silicate coating MFI-type zeolite of the present invention, MFI-type zeolite that is a core is tetrapropylammonium bromide (TPABr), or tetrapropylammonium hydroxide (TPAOH), tetraethylammonium hydroxide, etc. preferred that the crystallization using the specified first and, among them, it is more preferable to use tetrapropyl ammonium bromide (TPABr) structure as defined claim. 코어가 되는 MFI형 제올라이트를 합성할 때에 이용하는 실리카원으로서는, 무정형 실리카, 아몰퍼스 실리카, 퓸드 실리카, 콜로이달 실리카, 오르토규산 테트라에틸(TEOS), 규산나트륨, 규산칼륨, 규산리튬 등을 사용할 수 있다. As the silica source to be used when the synthesis of the MFI-type zeolite which is a core, can be used amorphous silica, amorphous silica, fumed silica, colloidal silica, ortho-silicic acid tetraethyl (TEOS), sodium silicate, potassium silicate, lithium silicate or the like. 또, 알루미늄원으로서는, 알루민산나트륨, 알루민산칼륨, 염화알루미늄, 질산알루미늄, 황산알루미늄, 수산화알루미늄 등을 사용할 수 있다. In addition, as the aluminum source, sodium aluminate, potassium aluminate, aluminum chloride, aluminum nitrate, aluminum sulfate, may be used aluminum hydroxide or the like. 실리카원, 알루미늄원에 부가하여, 불화물 이온 존재 하에서 코어가 되는 MFI형 제올라이트를 결정화시켜도 된다. The silica source, in addition to the aluminum source, is also possible to crystallize the MFI-type zeolite which is the core under the presence of fluoride ion. MFI형 제올라이트의 X선 회절 스펙트럼에 있어서, 2θ = 7.0∼8.4°에 있는 피크 a'와, 2θ = 8.4∼9.7°에 있는 피크 b'의 피크 면적비 b'/a'가 1 이상인 MFI형 제올라이트를 얻는 것을 기대할 수 있기 때문에, 수용액 중에서 불화물 이온이 되는 불소원으로서, 불화암모늄이나 불화수소 등을 사용해도 된다. An X-ray diffraction pattern of MFI-type zeolite, 2θ = peak in 7.0~8.4 ° of a 'and, 2θ = peak b in 8.4~9.7 °, the peak area ratio b' / a 'is one or more of MFI-type zeolite because it can be expected to get, as the fluorine source is fluoride ion in aqueous solution, it may be used such as ammonium fluoride or hydrogen fluoride. 또한, 불소원을 포함하지 않고 합성할 때에는, 실리카원으로서 TEOS만을 사용하는 것이 바람직하다. In addition, when the synthesis does not include a fluorine source, it is preferable to use only the TEOS as silica source. 실리카원으로서 TEOS만을 사용하여 MFI형 제올라이트를 합성한 경우, 이유는 확실하지 않으나, 합성한 MFI형 제올라이트의 X선 회절 스펙트럼에 있어서, 2θ = 7.0∼8.4°의 피크 a'와, 2θ = 8.4∼9.7°의 피크 b'의 면적비 b'/a'가 1 이상이 되기 쉽기 때문이다. If one uses only the TEOS as silica source synthesizing MFI-type zeolite, although the reason is not clear, the X-ray diffraction spectrum of the synthesized MFI-type zeolite, and the peak 2θ = a 'of 7.0~8.4 °, 2θ = 8.4~ "area ratio b in the" b peaks of 9.7 ° / a, is due likely to be more than one. 또, 불소원을 포함하여 MFI형 제올라이트를 합성할 때에는, 실리카원으로서 퓸드 실리카를 이용하는 것이 바람직하다. In addition, if the fluorine source, including the synthesis of the MFI-type zeolite, it is preferable to use a fumed silica as the silica source. 퓸드 실리카를 불소원과 함께 사용하여 MFI형 제올라이트를 합성한 경우, 이유는 확실하지 않으나, 합성한 MFI형 제올라이트의 X선 회절 스펙트럼에 있어서, 면적비 b'/a'가 1 이상이 되기 쉽기 때문이다. If you use a fumed silica with a fluorine source synthesizing MFI-type zeolite, the reason is, but not clear, the X-ray diffraction spectrum of the synthesized MFI-type zeolite, is easily a ratio b '/ a' is greater than 1 . 또, 목적으로 하는 MFI형 제올라이트의 조성에 따라, 광화제의 존재 하에서 코어가 되는 MFI형 제올라이트를 결정화해도 되며, 광화제로서는, 알칼리 금속 또는 알칼리토류 금속의 수산화물을 사용할 수 있고, 구체적으로는 수산화나트륨 등을 들 수 있다. In addition, depending on the composition of the MFI-type zeolite for the purpose, and may be crystallized to MFI-type zeolite which is a core in the presence of a mineralizer, as mineralizer, can be used an alkali metal or a hydroxide of an alkali earth metal, specifically, hydroxide there may be mentioned sodium and the like. 코어가 되는 MFI형 제올라이트는, 수열 합성 등에 의하여 결정화시키는 것이 바람직하다. MFI-type zeolite that is a core is preferably crystallized by the hydrothermal synthesis or the like. 수열 합성 처리는 일반적인 방법을 취할 수 있고, 예를 들면, 실리카원, 알루미늄원, 불소원, 광화제, 구조 규정제를 물 또는 알코올 수용액과 혼합하여 전구액으로 하고, 얻어진 전구액을 오토클레이브에 도입하여 가열함으로써 행한다. Hydrothermal treatment may take a general method, for example, a silica source, an aluminum source, a fluorine source, optical agents, structure rules and the first mixed with water or an alcohol aqueous solution as a light bulb liquid bulb liquid of the autoclave was obtained is carried out by heating was introduced. 수열 합성 처리의 온도는 100℃ 이상 250℃ 이하로 하는 것이 바람직하고, 150℃ 이상 200℃ 이하의 온도에서 수열 합성 처리하는 것이 더 바람직하다. The temperature of the hydrothermal treatment, it is more preferable to be preferred, and hydrothermal treatment at a temperature of up to more than 150 ℃ 200 ℃ to a range from 100 ℃ 250 ℃. 또, 수열 합성 처리의 시간은 0.5 시간 이상 120 시간 이하가 바람직하고, 1 시간 이상 100 시간 이하가 더 바람직하며, 10 시간 이상 100 시간 이하로 하는 것이 더 바람직하다. The time of the hydrothermal treatment is 0.5 hours or more and 120 hours or less preferably, and 100 hours or less and more preferably 1 hour or more, more preferably in a range from 10 hours to 100 hours. 또한, 수열 합성 처리는 복수 회 실시해도 상관없다. Further, the hydrothermal treatment is not carried out the correlation several times. 결정화시킨 코어는 80∼140℃에서 건조시키고, 소성 처리를 행하지 않고(소성 이력이 없는 상태에서), 이어서, 코어의 외표면을 실리케이트로 피복하는 것이 바람직하다. Crystallization was the core is preferably dried at 80~140 ℃ and, covering the without performing the firing process (in the absence of the firing history status), then the core outer surface of a silicate. 결정화시킨 코어에 소성 처리를 행하지 않음으로써, X선 회절 스펙트럼에 있어서, 2θ = 7.0∼8.4°에 있는 피크 a'와, 2θ = 8.4∼9.7°에 있는 피크 b'의 피크 면적비 b'/a'가 1 이상인 MFI형 제올라이트를 얻는 것을 기대할 수 있다. By not performing the firing process in which the core crystallization, X-ray diffraction in the spectrum, a peak 2θ = 7.0~8.4 ° in a 'and, 2θ = peak b in 8.4~9.7 °, the peak area ratio b' / a ' 1 can be expected to at least get the MFI-type zeolite. 코어가 되는 MFI형 제올라이트를 조제할 때에 광화제를 사용한 경우에는, 코어의 외표면을 실리케이트로 피복하기 전에 이온 교환 처리를 행해도 된다. When using the optical agent upon preparation of the MFI-type zeolite which has a core, it may be carried out the ion exchange treatment prior to coating the outer surface of the core by a silicate. 여기서 말하는 이온 교환 처리는, 제올라이트를 프로톤형으로 하는 것을 가리킨다. Ion exchange treatment mentioned here is, refers to the zeolite in the proton form. 알칼리 금속 이온 등을 암모늄 이온과 교환하여 제올라이트를 암모늄형으로 한 후, 그것을 소성 처리하여 프로톤형으로 함으로써, 활성이 발현된다. By the zeolite to exchange with ammonium ions, alkali metal ions, and then with ammonium type, and that the firing process proton type, and is the expression of activity. 암모늄 이온원으로서는, 질산암모늄이나 염화암모늄 등을 들 수 있다. As the ammonium ion source, and the like ammonium nitrate or ammonium chloride. 이온 교환 처리는, 결정화시킨 코어를 80∼140℃에서 건조시키고, 그 후 450℃∼700℃의 온도에서 2∼10시간 소성 처리를 행한 후, 실온∼100℃의 암모늄 이온이 들어간 수용액에 제올라이트를 투입하고, 10분∼1일 교반한 후, 여과 분리 한다. Ion exchange process, after drying the core was crystallized from 80~140 ℃, subjected to 2-10 hours and then calcined at a temperature of 450 ℃ ~700 ℃, the zeolite in an aqueous solution containing ammonium ions at room temperature ~100 ℃ the input and, after stirring for 10 minutes to 1 day, and filtered. 이어서, 80∼140℃에서 건조, 250∼600℃의 온도에서 0.5∼10시간 소성 처리를 추가로 행함으로써, 프로톤형으로 한다. Then, by performing an additional 0.5~10 sigan firing process in the drying, the temperature of 80~140 250~600 ℃ in ℃, and a proton type. 비용 삭감의 관점에서 제조 공정을 줄이고자 하는 경우에는, 이온 교환 후에 행하는 건조 후, 소성 처리를 거치지 않고 실리케이트 피복을 행해도 된다. If to reduce the manufacturing process in terms of cost reduction, the dried performed after the ion exchange, without going through a firing process it may be performed a silicate coating. 코어가 되는 MFI형 제올라이트의 세공 내나 외표면에 제올라이트 골격 외에 유래하는 알루미늄이 있으면, 실리케이트로 피복할 때에 그 알루미늄이 용출되어, 제올라이트 외표면에 들어가서 산점을 발현해 버리기 때문에 바람직하지 못하다. If the pores of the outer surface naena MFI-type zeolite which is a core of aluminum derived zeolite skeleton in addition, when coated with an aluminum silicate that is eluted, it is not preferable because dumping to express the acid site get into the outer surface of zeolite. 코어가 되는 MFI형 제올라이트에 포함되는 전(全) 알루미늄 중, 제올라이트 골격 외에 유래하는 알루미늄의 비율은, 바람직하게는 10% 이하이고, 더 바람직하게는 5% 이하이며, 더 바람직하게는 1% 이하이다. Of the aluminum former (全) included in the MFI-type zeolite which is a core, the ratio of the aluminum originating in addition to the zeolite skeleton is preferably 10% or less, and more preferably not more than 5%, more preferably not more than 1% to be. 제올라이트 골격 외에 포함되는 알루미늄을 제거하는 방법으로서는 특별히 제한은 없으나, 50∼100℃의 물에 제올라이트를 투입하고, 10분∼1일 교반한 후, 여과 분리하고, 이어서 80∼140℃에서 건조하는 방법을 들 수 있다. To then as a method of removing the aluminum contained in addition to the zeolite skeleton is not particularly limited, the input of the zeolite but 50~100 ℃ water, stirred 10 minutes to 1 day, filtered off and then dried at 80~140 ℃ It can be given. 또는, 전술한 이온 교환 처리에 의해서도 골격 외 알루미늄을 제거할 수 있다. Alternatively, it is possible to remove the outer framework aluminum by the process the above-mentioned ion exchange. 이온 교환 처리에 의해 골격 외 알루미늄을 제거하면, 이온 교환과 동시에 할 수 있어, 더 바람직하다. Removing the outer skeleton aluminum by an ion exchange treatment, it is possible to at the same time as the ion exchange, is more preferable. 코어가 되는 MFI형 제올라이트를 피복하는 실리케이트는, 방향족 탄화수소, 특히는 톨루엔 불균화 반응 및 알킬화 반응에 불활성인 것이 바람직하고, 알루미나 성분(활성 성분)을 포함하지 않는 순 실리카(예를 들면, 실리카라이트)인 것이 바람직하다. Pure silica is a silicate coating the MFI-type zeolite which is a core, an aromatic hydrocarbon, in particular, is preferably inert to the toluene disproportionation reaction and transalkylation reaction, which does not include an alumina component (active ingredient) (e. G., Silicalite ) it is preferably. 순 실리카는, 산점이 거의 없기 때문에, 피복 후의 MFI형 제올라이트 표면을 불균화 반응 등에 대하여 불활성화할 수 있다. Pure silica, can be inactivated for the MFI-type zeolite surface after covering disproportionation reaction or the like because there are few acid sites. MFI형 제올라이트를 순 실리카로 균일하게 결함 없이 피복함으로써, 외표면에서의 불균화 반응이나 이성화 반응 등을 억제하고, 세공 내의 분자체 사이즈에 따른 반응만을 일으킬 수 있다. By coating the MFI-type zeolite without uniformly defects in the silica in order to suppress such a disproportionation reaction or the isomerization reaction in the outer surface and can cause only a reaction in accordance with the sieve size in the pore. 실리케이트 막의 질량은, 코어가 되는 MFI형 제올라이트 100 질량부에 대하여, 1 질량부 이상 100 질량부 이하로 하는 것이 바람직하다. Silicate film mass, based on 100 parts by mass of the MFI-type zeolite which is a core, and is preferably not more than 1 part by mass or more and 100 parts by mass. 코어가 되는 MFI형 제올라이트 100 질량부에 대하여 실리케이트 막이 1 질량부 미만에서는, 실리케이트 막의 분자체 작용을 충분히 발휘할 수 없어 바람직하지 않다. The silicate film is less than 1 part by mass based on 100 parts by mass of the MFI-type zeolite which is a core, which is not preferable can not sufficiently exhibit the silicate molecular sieve membrane action. 또, 코어가 되는 MFI형 제올라이트 100 질량부에 대하여 실리케이트 막이 100 질량부를 넘으면, 촉매 중의 코어가 되는 MFI형 제올라이트의 비율이 낮아지거나, 원료나 생성물이 실리케이트 막을 통과할 때의 저항이 커지거나 하여, 반응의 전화율을 저하시키기 때문에 바람직하지 않다. In addition, by, based on 100 parts by weight of MFI-type zeolite which is a core silicate film is higher than 100 parts by mass, or the ratio of the MFI-type zeolite which is the core of the catalyst decreases, increase the resistance at the time of the raw material or product through the membrane silicate, or it is not preferable because it decreases the conversion rate of the reaction. 실리케이트 막의 질량은, 코어가 되는 MFI형 제올라이트 100 질량부에 대하여, 10 질량부 이상 70 질량부 이하로 하는 것이 특히 바람직하다. Silicate film mass, based on 100 parts by mass of the MFI-type zeolite which is a core, it is particularly preferred that less than 10 parts by mass 70 parts by mass. 본 발명에 관련된 실리케이트 피복 MFI형 제올라이트는, 입자경이 1 ㎛ 이상 40 ㎛ 이하인 것이 바람직하고, 1 ㎛ 이상 25 ㎛ 이하인 것이 더 바람직하다. Silicate coating MFI-type zeolite of the present invention, particle size is preferably less than 1 ㎛ 40 ㎛, more preferably less than 25 ㎛ 1 ㎛. 실리케이트 피복 MFI형 제올라이트의 입자경이 40 ㎛보다 크면, 실리케이트 피복 MFI형 제올라이트 세공의 길이가 길어지고 반응 기질(원료)의 세공 내 확산 속도가 느려져, 실용적인 전화율이 얻어지지 않게 되기 때문이다. Is because the silicate coating is greater than the 40 ㎛ particle size of MFI-type zeolite, a silicate coating MFI type is the length of the zeolite pores increases slowed the rate of diffusion within the pores of the reaction substrate (raw material), a practical degree of conversion can not be obtained. 또, 실리케이트 피복 MFI형 제올라이트의 입자경이 1 ㎛보다 작으면, 코어가 되는 MFI형 제올라이트가 응집하여, 실리케이트로 균일하게 피복하기가 곤란하게 되기 때문이다. In addition, if the particle size of the silicate coating MFI-type zeolite is less than 1 ㎛, and the MFI-type zeolite which core aggregated, it is because the more difficult to uniformly coated with a silicate. 코어가 되는 MFI형 제올라이트의 실리케이트 피복 방법은, 이하에 기재된 방법에 한정되는 것은 아니나, 수열 합성법을 사용할 수 있다. Silicate coating method of the MFI-type zeolite which is the core include, but are not limited to the method described below, can be used for hydrothermal synthesis. 예를 들면, 원료인 오르토규산 테트라에틸(TEOS), 퓸드 실리카, 콜로이달 실리카 등의 실리카원, 테트라프로필암모늄 브로마이드(TPABr)나, 테트라프로필암모늄 히드록시드(TPAOH) 등의 구조 규정제를, 물 또는 알코올 수용액에 녹여 실리케이트 막 형성용 전구액을 조제한다. For example, the starting material o-silicic acid tetraethyl (TEOS), fumed silica, sources of silica, such as colloidal silica, tetrapropylammonium bromide (TPABr), or tetrapropylammonium hydroxide the structure defined, such as (TPAOH), to prepare a film-forming silicate bulb solution dissolved in water or aqueous alcohol. 이 때, 당해 전구액은 불화물 이온을 포함하지 않는 것이 바람직하다. At this time, the art bulb solution preferably does not contain a fluoride ion. 또한, 실리케이트 막 형성용 전구액에 있어서, 실리카원은 산화물 기준으로 물 120 몰에 대하여 0.5∼5 몰, 구조 규정제는 물 120 몰에 대하여 0.01∼0.5 몰이 되도록 혼합하는 것이 바람직하다. Further, in the silicate film bulb liquid for forming a silica source is the 0.5 to 5 moles, with respect to the structure defined water 120 mol, based on the oxides, it is preferable to mix so that 0.01 to 0.5 mol relative to 120 mol of water. 코어가 되는 MFI형 제올라이트와 실리케이트 막 형성용 전구액을 넣은 오토클레이브를 오븐에 넣어 가열함으로써 행한다. It is carried out by heating the autoclave was put into a MFI type zeolite and silicate bulb liquid for film formation which is a core in the oven. 이 수열 합성 처리의 온도는, 100℃ 이상 250℃ 이하로 하는 것이 바람직하고, 150℃ 이상 200℃ 이하의 온도에서 수열 합성 처리하는 것이 더 바람직하다. The temperature of the hydrothermal treatment, it is more preferable that it is preferable, hydrothermal treatment at a temperature of up to more than 150 ℃ 200 ℃ to a range from 100 ℃ 250 ℃. 또, 수열 합성 처리의 시간은 0.5 시간 이상 48 시간 이하가 바람직하고, 1 시간 이상 36 시간 이하로 하는 것이 더 바람직하다. The time of the hydrothermal treatment is more preferably in a range that is a range from 0.5 to 48 hours preferably, 1 hour and 36 hours. 수열 합성 처리 후, 실리케이트 피복 MFI형 제올라이트를 취출(取出)하여 80∼140℃에서 건조하고, 추가로 소성 처리를 행한다. After the hydrothermal treatment, the silicate coating with an MFI-type take-out (取出) zeolite was dried at 80~140 ℃ and performs the additional baking treatment to. 소성 처리는, 필요에 따라 0.1℃∼10℃/분의 승온 속도로 승온하고, 그 후 450℃∼700℃의 온도에서 2∼10시간 열 처리함으로써 행하면 된다. Calcination process, as necessary, and temperature was raised at a heating rate of 0.1 ℃ ~10 ℃ / min, and is then performed by 2-10 hours heat treatment at a temperature of 450 ℃ ~700 ℃. 소성에 의해서 세공 내에 있는 구조 규정제를 제거하고, 코어 및 실리케이트 막에 분자체가 되는 세공을 형성한다. By calcination to remove the structure defined in claim in the pores, and forms a pore which the molecular sieve in the core and a silicate film. 코어가 되는 MFI형 제올라이트를 조제할 때에 광화제를 사용한 경우에는, 상기 소성 처리 후, 추가로 실리케이트 피복 MFI형 제올라이트를 이온 교환 처리하여, 본 발명의 실리케이트 피복 MFI형 제올라이트를 얻는 것이 바람직하다. When using the optical agent upon preparation of the MFI-type zeolite which has a core, after the firing process, in addition to a silicate treatment coating MFI-type zeolite to ion exchange, it is desired to obtain a silicate coating MFI-type zeolite of the present invention. 이온 교환 처리 방법은, 앞서 기술()한 바와 마찬가지이다. Ion exchange treatment method is the same as previously described (). 단, 실리케이트 피복 처리 전에 이온 교환 처리를 행하고 있는 경우에는, 실리케이트 피복 후의 이온 교환 처리를 행하지 않아도 된다. However, in the case of performing an ion exchange process prior to the silicate coating process, it is without performing an ion exchange treatment after the silicate coating. 즉, 코어가 되는 MFI형 제올라이트를 조제할 때에 광화제를 사용한 경우에는, 전술한 코어가 되는 MFI형 제올라이트의 조제 단계, 또는 실리카 피복 MFI형 제올라이트의 소성 처리 후 중 어느 하나에 이온 교환 처리를 행하면 된다. That is, when using the optical agent upon preparation of the MFI-type zeolite which is a core, carrying out the ion exchange process as in any of the post baking process of the preparation phase of the MFI-type zeolite which has the aforementioned core, or silica-coated MFI-type zeolite do. 이하에서, 본 발명의 실리케이트 피복 MFI형 제올라이트의 제조 방법에 대하여, 도 1을 참조하여 설명한다. In the following, a manufacturing method of the silicate coating MFI-type zeolite of the present invention will be described with reference to FIG. 도 1은, 본 발명의 실리케이트 피복 MFI형 제올라이트의 제조 공정의 일례이다. Figure 1 is an example of the manufacturing process of silicate-coated MFI-type zeolite of the present invention. 도 1에 나타낸 바와 같이, 본 발명의 실리케이트 피복 MFI형 제올라이트의 제조 공정에 있어서, 먼저, 코어가 되는 MFI형 제올라이트를 합성하기 위하여, 전구액을 조제하여(단계 S101), 수열 합성 처리에 의하여 MFI형 제올라이트를 형성하고(단계 S102), 건조를 행한다(단계 S103). As shown in Figure 1, in the manufacturing process of silicate-coated MFI-type zeolite of the present invention, first of all, for synthesizing MFI-type zeolite which is a core, to prepare a precursor solution (step S101), random number sequence by synthesis process MFI forming a zeolite (step S102), it carries out the drying (step S103). 코어가 되는 MFI형 제올라이트는 상기의 방법으로 조제한 것이어도 되고, 피크 면적비 b/a가 1 이상인 것이라면, 시판품을 사용할 수도 있다. MFI-type zeolite is that the core and even if less than that prepared by the above method, the peak area ratio b / a 1, may be used a commercially available product. 계속해서, MFI형 제올라이트를, 실리카원과 구조 규정제를 물 또는 알코올 수용액에 소정량 분산시킨 실리케이트 막 형성용 전구액에 침지한다(단계 S104). Subsequently, the immersion of the MFI-type zeolite, a silica source and structure provisions of water or a predetermined amount of dispersion in which silicate film bulb liquid for forming the alcoholic solution (step S104). 실리케이트 막 형성용 전구액에 침지 전의 MFI형 제올라이트는, S102의 수열 합성 처리 후, 소성 처리되지 않은 것, 즉 소성 이력이 없는 것이 바람직하다. Silicate film MFI-type zeolite before the immersion liquid for forming the light bulb is, after the hydrothermal synthesis process in S102, it may not be firing process, that is, it is preferable that there is no history of firing. 소성 처리를 행하지 않은 MFI형 제올라이트는 실리케이트 막이 균일하게 성장하기 쉽기 때문이다. MFI-type zeolite has not been subjected to the firing process is easily silicate film is uniformly grown. 그 후, 실리케이트 막 형성용 전구액에 침지한 MFI형 제올라이트를, 소정 온도에서 수열 합성 처리하여 실리케이트 막을 형성한다(단계 S105). Then, the silicate film the MFI-type zeolite is immersed in the liquid for forming a light bulb, by hydrothermal treatment at a predetermined temperature to form a film silicate (step S105). 수열 합성 처리는 100∼250℃의 온도 범위로 0.5∼48시간 행해진다. Hydrothermal processing is performed 0.5~48 hours at a temperature range of 100~250 ℃. 수열 합성 처리 후, 실리케이트 피복 MFI형 제올라이트를 건조하고(단계 S106), 450℃∼700℃의 온도 범위로 소정 시간 소성하는 소성 처리를 행한다(단계 S107). After the hydrothermal treatment is carried out for the MFI-type zeolite dried silicate coating (step S106), the firing process for a predetermined time in the firing temperature range of 450 ℃ ~700 ℃ (step S107). 당해 소성 처리에 의하여, 코어 및 실리케이트 막에 분자체가 되는 세공을 형성하여 실리케이트 피복 MFI형 제올라이트를 제조한다. By the art baking process, by a core and a silicate film forms a pore which the silicate molecular sieve to produce a coating MFI-type zeolite. 상기의 방법에 의하여 조제한 실리케이트 피복 MFI형 제올라이트는, pKa 값이 ＋3.3인 하메트 지시약(p-디메틸아미노아조벤젠)에 의해 착색되지 않는, 즉, pKa 값이 ＋3.3 이상이고, MFI형 제올라이트의 외표면 산점이 반응에 불활성인 실리케이트로 피복되어 있다. And by the method of coating a silicate prepared MFI-type zeolite, a pKa value that is not colored by the indicator, and meth (p- dimethylamino-azobenzene) +3.3, that is, pKa is above +3.3, MFI-type zeolite is the external surface acid sites are coated with a silicate inert to the reaction. 상기의 방법에 의하여 조제한 실리케이트 피복 MFI형 제올라이트를, 방향족 탄화수소, 특히는 톨루엔 불균화 반응 또는 알킬화 반응에 이용함으로써, p-크실렌을 고선택률로 제조할 수 있다. The prepared silicate coating MFI-type zeolite by the method described above, an aromatic hydrocarbon, in particular, may be prepared by the use in toluene disproportionation reaction or an alkylation reaction, and the p- xylene selectivity. 또한, 상기의 단계 S101 및 S102에 있어서, 광화제를 포함하는 MFI형 제올라이트 전구액을 사용하여 코어가 되는 MFI형 제올라이트를 수열 합성 처리한 경우에는, 단계 S103의 건조 공정 후에 소성하여 이온 교환 처리를 행하거나, 혹은 단계 S107의 소성 공정 후에 이온 교환 처리를 행하는 것이 바람직하다. In the above steps S101 and S102 of, in the case where the MFI-type zeolite which is using the MFI-type zeolite bulb solution containing mineralizer core processing hydrothermal synthesis, by firing after the step S103, a drying step for the ion exchange process to carry out the line, or ion exchange treatment after the sintering process of the step S107 is preferred. 본 발명의 실시 형태에 관련된 실리케이트 피복 MFI형 제올라이트를 이용한, 방향족 탄화수소의 불균화 반응에 의한 p-크실렌의 제조에 대하여 설명한다. Using silicate coating MFI-type zeolite according to an embodiment of the present invention will be described for the preparation of p- xylene by the disproportionation reaction of the aromatic hydrocarbon. p-크실렌 제조의 원료로서는 톨루엔이 바람직하다. With preference given to toluene as the raw material of p- xylene production. 원료인 톨루엔은, 불순물로서 물, 올레핀, 황화합물 및 질소화합물을 포함할 수 있으나, 불순물 함유량은 적은 것이 바람직하다. The raw material is toluene, but may include water, olefins, sulfur compounds and nitrogen compounds as impurities, the impurity content is preferably less. 수분 함유량은, 200 질량 ppm 이하가 바람직하고, 100 질량 ppm 이하인 것이 더 바람직하다. The water content is not more than 200 ppm by weight is preferred, more preferably not more than 100 mass ppm. 또, 올레핀 함유량은 1 질량% 이하가 바람직하고, 0.5 질량% 이하인 것이 더 바람직하다. In addition, it is olefins content is more preferably not more than 1% by mass or less, and 0.5% by mass. 또한, 질소화합물 함유량은 1 질량 ppm 이하가 바람직하다. Furthermore, the nitrogen compound content is 1 mass ppm or less. 또한, 여기서 말하는 수분 함유량은 JIS K 2275 「원유 및 석유 제품 - 수분 시험 방법」의 칼 피셔식 전량적정법(電量滴定法)으로, 올레핀 함유량은 JIS K 2536 「석유 제품 - 성분 시험 방법」의 형광 지시약 흡착법으로, 질소화합물 함유량은 JIS K 2609 「원유 및 석유 제품 - 질소분 시험 방법」의 화학발광법으로 측정되는 값이다. In addition, the water content referred to here are JIS K 2275 - a Karl Fischer quantity titration method (電量 滴定 法) of the "Crude petroleum and petroleum products moisture test method", the olefin content of JIS K 2536 - fluorescence indicator of "oil ingredients test method" the adsorption method, the nitrogen compound content of JIS K 2609 - is a value measured by the chemiluminescence of the "crude petroleum and petroleum products jilsobun test method". 방향족 탄화수소의 불균화 반응은, 방향족 탄화수소를 액 공간 속도(LHSV) 0.01 h -1 ∼10 h -1 의 범위로 공급하여, 본 실시 형태에 관련된 실리케이트 피복 MFI형 제올라이트와 접촉시키는 것이 바람직하다. Disproportionation reaction of an aromatic hydrocarbon is, by supplying the aromatic hydrocarbon in the range of the liquid space velocity (LHSV) 0.01 h -1 ~10 h -1, preferably is contacted with a silicate coating MFI-type zeolite according to this embodiment. 방향족 탄화수소의 액 공간 속도(LHSV)는, 0.1 h -1 ∼5 h -1 의 범위로 공급하는 것이 더 바람직하다. The liquid space velocity of the aromatic hydrocarbon (LHSV) is, it is more preferable to supply a range of 0.1 h -1 ~5 h -1. 방향족 탄화수소의 불균화 반응은 200℃∼550℃의 범위로 가열하여 반응을 행하는 것이 바람직하다. Disproportionation reaction of the aromatic hydrocarbon and the reaction is preferably carried out by heating in the range of 200 ℃ ~550 ℃. 반응 온도가 200℃보다 낮으면 반응이 진행되기 어렵고, 반응 온도가 550℃보다 높으면, p-크실렌의 선택률이 내려가거나 에너지 소비가 커지거나 하기 때문에 바람직하지 않다. Difficult to react if the reaction temperature is lower than 200 ℃ proceeds, the reaction temperature is higher than 550 ℃, a selectivity of p- xylene or down is not preferred because energy consumption increases or. 반응 온도는 230℃∼530℃가 더 바람직하고, 260℃∼510℃가 특히 바람직하다. The reaction temperature is more preferably 230 ℃ ~530 ℃, and the 260 ℃ ~510 ℃ is particularly preferred. 또, 반응시 압력은 대기압∼10 MPaG로 행하는 것이 바람직하고, 0.5 MPaG∼5 MPaG로 행하는 것이 더 바람직하다. In addition, when the reaction pressure is more preferably carried out as it is desirable, and 0.5 MPaG MPaG~5 performed in atmospheric pressure ~10 MPaG. 본 발명의 실시 형태에 관련된 실리케이트 피복 MFI형 제올라이트를 이용한, 방향족 탄화수소의 알킬화 반응에 의한 p-크실렌의 제조에 대하여 설명한다. Using silicate coating MFI-type zeolite according to an embodiment of the present invention will be described for the preparation of p- xylene by the alkylation of aromatic hydrocarbons. 원료의 방향족 탄화수소로서는 벤젠 및 톨루엔을 들 수 있다. The aromatic hydrocarbon of the raw material benzene and toluene. 또한, 원료의 방향족 탄화수소는, 벤젠 및 톨루엔 이외의 탄화수소 화합물을 포함하고 있어도 된다. Further, the aromatic hydrocarbon raw material, it may contain a hydrocarbon compound other than benzene and toluene. 단, p-크실렌이 목적 생성물이기 때문에, m-크실렌이나 o-크실렌을 원료에 포함하는 것은 바람직하지 않다. However, since the p- xylene is the desired product, the inclusion of m- xylene, o- xylene and the raw material is not preferable. 반응성이 높은 톨루엔이 원료로서 더 바람직하다. The high reactivity of toluene is more preferable as a raw material. 방향족 탄화수소의 알킬화 반응에 이용하는 알킬화제로서는 메탄올, 디메틸에테르를 들 수 있다. As the alkylating agent used for alkylation of the aromatic hydrocarbons may be mentioned methanol, dimethyl ether. 이들은 시판품을 이용할 수도 있으나, 예를 들면, 수소와 일산화탄소의 혼합 가스인 합성가스로부터 제조한 메탄올이나 디메틸에테르나, 메탄올의 탈수 반응에 의해 제조한 디메틸에테르를 출발 원료로 해도 된다. They may be used but a commercially available product, for example, may be a methanol or dimethyl ether or a dimethyl ether produced by the dehydration of methanol produced from a gaseous mixture of synthesis gas of hydrogen and carbon monoxide as starting materials. 또한, 벤젠, 톨루엔 및 메탄올, 디메틸에테르 중에 존재할 가능성이 있는 불순물로서는, 물, 올레핀, 황화합물 및 질소화합물을 들 수 있으나, 이들은 적은 것이 바람직하다. Also, benzene, toluene and methanol as an impurity that may be present in the dimethyl ether, but may include water, olefins, sulfur compounds and nitrogen compounds, it is preferably small. 수분 함유량으로서는 200 중량 ppm 이하, 더 바람직하게는 100 중량 ppm 이하, 올레핀 함유량으로서는 1 중량% 이하, 더 바람직하게는 0.5 중량% 이하, 황화합물 함유량 및 질소화합물 함유량으로서는 1 중량 ppm 이하, 더 바람직하게는 0.1 중량 ppm 이하이다. The water content as 200 to ppm by weight or less, more preferably 100 ppm by weight, an olefin content as 1 wt% or less, more preferably 0.5 wt% or less, and the sulfur compound content and a nitrogen compound content as 1 ppm by weight or less, more preferably 0.1 ppm by weight or less. 또한, 여기서 말하는 수분 함유량은 JIS K 2275 「원유 및 석유 제품 - 수분 시험 방법」의 칼 피셔식 전량적정법으로, 올레핀 함유량은 JIS K 2536 「석유 제품 - 성분 시험 방법」의 형광 지시약 흡착법으로, 유황화합물 함유량은 JIS K 2541 「원유 및 석유 제품 - 유황분 시험 방법」으로, 질소화합물 함유량은 JIS K 2609 「원유 및 석유 제품 - 질소분 시험 방법」의 화학발광법으로 측정되는 값이다. In addition, the water content referred to here are JIS K 2275 - a Karl Fischer quantity titration method "Crude petroleum and petroleum products moisture test method", the olefin content of JIS K 2536 - a fluorescent indicator adsorption method of "oil ingredients test method", a sulfur compound content of JIS K 2541 "crude petroleum and petroleum products - sulfur content test method" is a value measured by the chemiluminescence method of "test method jilsobun crude oil and petroleum products", the nitrogen compound content of JIS K 2609. 방향족 탄화수소의 알킬화 반응에 있어서의 알킬화제와 방향족 탄화수소의 비율에 대해서는, 메틸기와 방향족 탄화수소의 몰비로서 5/1∼1/20이 바람직하고, 2/1∼1/10이 더 바람직하며, 1/1∼1/5이 특히 바람직하다. For the alkylating agent and the ratio of the aromatic hydrocarbon in the alkylation of an aromatic hydrocarbon, and 5 / 1~1 / 20 preferable as a molar ratio of the methyl group with an aromatic hydrocarbon and, 2 / 1~1 / 10 More preferably, 1/1 to 1/5 it is particularly preferred. 방향족 탄화수소에 대하여 알킬화제가 극단적으로 많은 경우에는, 바람직하지 않은 알킬화제끼리의 반응이 진행되어 버려, 촉매 열화의 원인이 되는 코킹을 일으킬 가능성이 있기 때문에 바람직하지 않다. When the alkylating agent is extremely large with respect to the aromatic hydrocarbons, the undesirable reaction between the alkylating agent is conducted away, it is not preferable because it is likely to cause coking of the catalyst to cause deterioration. 또, 방향족 탄화수소에 대하여 알킬화제가 극단적으로 적은 경우에는, 방향족 탄화수소에의 알킬화 반응이 진행되지 않고, 방향족 탄화수소의 리사이클이 증가해 버리기 때문에 바람직하지 않다. In addition, when the alkylating agent with respect to the aromatic hydrocarbon is extremely small, but the alkylation of the aromatic hydrocarbon not proceed, it is not preferable because it is of discard aromatic hydrocarbon recycling increases. 방향족 탄화수소의 알킬화 반응은, 원료의 방향족 탄화수소를 액 공간 속도(LHSV) 0.01 h -1 이상, 더 바람직하게는 0.1 h -1 이상이며, 10 h -1 이하, 더 바람직하게는 5 h -1 이하로 공급하여, 본 실시 형태에 관련된 실리케이트 피복 MFI형 제올라이트와 접촉시킴으로써 행하는 것이 바람직하다. Alkylation of aromatic hydrocarbons, and aromatic hydrocarbons of the raw material liquid space velocity (LHSV) 0.01 h -1 or more, more preferably 0.1 h -1 or more, 10 h -1 or less, more preferably 5 h -1 or less supplying to, it is preferably carried out by contacting the silicate coating MFI-type zeolite according to this embodiment. 알킬화 반응의 반응 조건은, 특별히 한정되는 것은 아니나, 반응 온도가 바람직하게는 200℃ 이상, 더 바람직하게는 230℃ 이상, 특히 바람직하게는 260℃ 이상이며, 바람직하게는 550℃ 이하, 더 바람직하게는 530℃ 이하, 특히 바람직하게는 510℃ 이하이며, 또, 압력이 바람직하게는 대기압 이상, 더 바람직하게는 0.1 MPaG 이상, 특히 바람직하게는 0.5 MPaG 이상, 바람직하게는 10 MPaG 이하, 더 바람직하게는 5 MPaG 이하이다. The reaction conditions for the alkylation reaction include, but are not particularly limited, the reaction temperature is preferably not less than 200 ℃, more preferably not less than 230 ℃, particularly preferably at least 260 ℃, preferably 550 ℃ or less, more preferably is 530 ℃ or less, and particularly preferably not more than 510 ℃, again, the pressure is preferably atmospheric pressure or higher, more preferably at least 0.1 MPaG, particularly preferably at least 0.5 MPaG, preferably from 10 MPaG or less, more preferably is less than or equal to 5 MPaG. 또, 알킬화 반응에는, 질소나 헬륨과 같은 불활성 가스나 코킹을 억제하기 위한 수소를 유통해도 되고, 그 때, 압력은 대기압이더라도 가압해도 된다. Further, in the alkylation reaction, and even distribution of hydrogen for suppressing the inert gas such as nitrogen or helium, or caulking, At this time, the pressure is atmospheric pressure, even if the pressure. 또한, 반응 온도가 너무 낮으면, 방향족 탄화수소나 알킬화제의 활성화가 불충분하기 때문에, 원료 방향족 탄화수소의 전화율이 낮고, 한편, 반응 온도가 너무 높으면, 에너지를 많이 소비하게 되는 것에 부가하여, 촉매 수명이 짧아지는 경향이 있다. Further, if the reaction temperature is too low, because the sufficient activation of the aromatic hydrocarbon or alkylating agent, a low conversion rate of the raw material aromatic hydrocarbon, on the other hand, too high reaction temperature, in addition to which the consuming energy, shorten the catalyst life It tends to be. 본 발명에 관련된 실리케이트 피복 MFI형 제올라이트는, 실리케이트 피복 MFI형 제올라이트의 X선 회절 스펙트럼에 있어서, 2θ = 7.0∼8.4°에 있는 피크 a와, 2θ = 8.4∼9.7°에 있는 피크 b의 피크 면적비 b/a가 1 이상이고, 또한, 하메트 지시약에 의하여 측정된 pKa 값이 ＋3.3 이상인 것을 특징으로 하고, 본 발명의 실리케이트 피복 MFI형 제올라이트를, 방향족 탄화수소, 특히는 톨루엔의 불균화 반응 또는 알킬화 반응에 사용함으로써, 고순도의 p-크실렌을 높은 선택률로 제조할 수 있다. Silicate coating MFI-type zeolite of the present invention, the silicate coating the X-ray diffraction pattern of MFI-type zeolite, and the peak 2θ = a in 7.0~8.4 °, 2θ = peak area ratio of Peak b in 8.4~9.7 ° b / a is 1 or larger, and wherein the mat than the pKa value of +3.3 measured by the indicator, and the silicate-coated MFI-type zeolite of the present invention, an aromatic hydrocarbon, especially toluene disproportionation reaction or an alkylation by using in the reaction, it can be prepared with high purity of p- xylene with high selectivity. 이하에, 본 발명을 실시예에 의하여 상세하게 설명한다. It will be described in detail by the following, the invention to the embodiment. 본 발명은 이하에 설명하는 실시예에 제한되는 것은 아니다. The invention is not limited to the embodiment to be described below. 맨 처음으로, 피크 면적비 b'/a'가 1 이상인 ZSM-5(합성예 1∼5 및 7)와, 피크 면적비 b'/a'가 1 미만인 ZSM-5를 제조 또는 준비하였다(합성예 6 및 시판품). First the way to the peak area ratio b '/ a' is less than 1 ZSM-5 (Synthesis Examples 1 to 5 and 7), the peak area ratio b '/ a' is 1, the ZSM-5 was prepared or prepared under (Synthesis Example 6 and commercially available). 합성예 1∼7 및 시판품의 ZSM-5를, 실리케이트 피복하여 실리케이트 피복 MFI형 제올라이트를 조제하였다(실시예 1∼5, 비교예 1∼3). The ZSM-5 of Synthesis Example 1-7 and commercially available products, thereby preparing a silicate coating MFI-type zeolite and silicate coating (Examples 1 to 5 and Comparative Examples 1 to 3). 오르토규산 테트라에틸(TEOS), 질산알루미늄, 수산화나트륨, 테트라프로필암모늄 브로마이드(TPABr) 및 탈 이온수를 이용하여, SiO 2 : Al 2 O 3 : Na 2 O : TPABr : H 2 O = 1 : 0.01 : 0.1 : 0.2 : 42(몰비. 실리카원, 알루미나원 및 나트륨원은 산화물을 기준으로 한 몰비)로 하고, 180℃에서 24시간 수열 합성하였다. Using the ortho-silicic acid tetraethyl (TEOS), aluminum nitrate, sodium hydroxide, tetrapropylammonium bromide (TPABr) and deionized water, SiO 2: Al 2 O 3 : Na 2 O: TPABr: H 2 O = 1: 0.01: 0.1: 0.2: 42 to (molar ratio of silica source, alumina source and a sodium source is one molar ratio, based on the oxide), was synthesized in 24 hours sequence 180 ℃. 수열 합성 후, 얻어진 생성물을 25℃에서 이온 교환수를 이용하여 세정 여과하여, 130℃에서 건조하였다. After the hydrothermal synthesis, it was washed by filtration using ion-exchanged water and the resulting product at 25 ℃, and dried at 130 ℃. 얻어진 ZSM-5의 SiO 2 /Al 2 O 3 은 97(몰비)이었다. The resulting ZSM-5 SiO 2 / Al 2 O 3 was 97 (mole ratio). 퓸드 실리카, 수산화알루미늄, 테트라프로필암모늄 브로마이드, 불화암모늄 및 탈 이온수를 이용하여, SiO 2 : Al 2 O 3 : TPABr : F － : H 2 O = 1 : 0.025 : 0.125 : 0.9 : 33(몰비. 실리카원 및 알루미나원은 산화물을 기준으로 한 몰비)으로 하고, 180℃에서 70시간 수열 합성하였다. Using a fumed silica, aluminum hydroxide, tetrapropyl ammonium bromide, ammonium fluoride, and deionized water, SiO 2: Al 2 O 3 : TPABr: F -:. H 2 O = 1: 0.025: 0.125: 0.9: 33 ( molar ratio of silica source and the alumina source is in a molar ratio, based on the oxide), which was synthesized in 70 hours sequence 180 ℃. 수열 합성 후, 얻어진 생성물을 25℃에서 이온 교환수를 이용하여 세정 여과하여, 130℃에서 12시간 건조 후, 550℃에서 7시간 소성 처리한 후, 이온 교환하고, 130℃에서 12시간 건조하고, 450℃에서 2시간 소성하였다. After the hydrothermal synthesis, by filtration washed with ion-exchanged water and the resulting product at 25 ℃, after 12 hours drying at 130 ℃, then at 550 ℃ treatment seven hours calcination, and ion-exchanged water, dried at 130 ℃ 12 hours, at 450 ℃ was fired for 2 hours. 얻어진 ZSM-5의 SiO 2 /Al 2 O 3 는 69(몰비)였다. The resulting ZSM-5 SiO 2 / Al 2 O 3 was 69 (mole ratio). 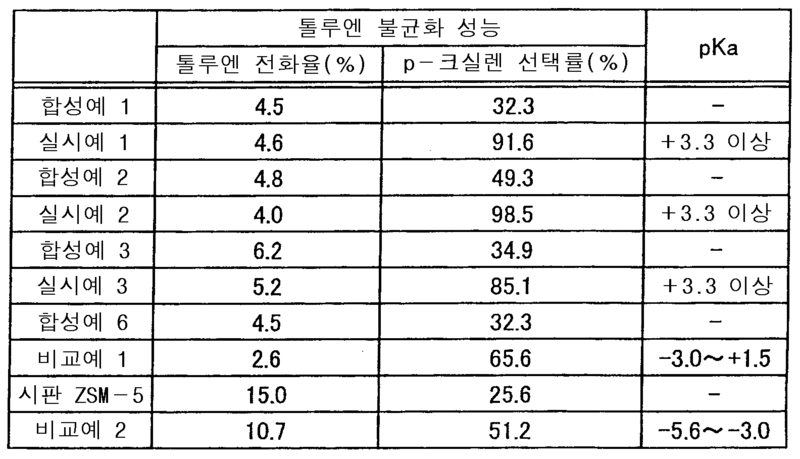 X선 광 전자 분광법에 의해 얻어진 ZSM-5의 불소 함유량을 측정하였더니, 0.1 mol% 미만이어서, ZSM-5 중에는 불소는 함유되어 있지 않음을 알 수 있었다. Was measured with a fluorine content of ZSM-5 obtained by X-ray photoelectron spectroscopy, it is less than 0.1 mol% and then, during the ZSM-5 was found that the fluorine does not contain. 오르토규산 테트라에틸(TEOS), 질산알루미늄, 수산화나트륨, 테트라프로필암모늄 브로마이드, 불화암모늄 및 탈 이온수를 이용하여, SiO 2 : Al 2 O 3 : Na 2 O : TPABr : F － : H 2 O = 1 : 0.01 : 0.1 : 0.2 : 1.4 : 42(몰비. 실리카원, 알루미나원 및 나트륨원은 산화물을 기준으로 한 몰비. )로 하고, 180℃에서 70시간 수열 합성하였다. O-silicic acid tetraethyl (TEOS), aluminum nitrate, sodium hydroxide, tetrapropylammonium bromide, using ammonium fluoride and deionized water, SiO 2: Al 2 O 3 : Na 2 O: TPABr: F -: H 2 O = 1 : 0.01: 0.1: 0.2: 1.4: 42 (molar ratio of silica source, alumina source and a sodium source is one molar ratio, based on the oxide.) was synthesized, and 70 hours in hydrothermal 180 ℃ to. 수열 합성 후, 얻어진 생성물을 25℃에서 이온 교환수를 이용하여 세정 여과하여, 건조 후, 550℃에서 7시간 소성 처리한 후, 이온 교환하고, 130℃에서 12시간 건조하고, 450℃에서 2시간 소성하였다. After the hydrothermal synthesis, by filtration washed with ion-exchanged water and the resulting product at 25 ℃, 2 hours at and then dried, treated in 550 ℃ 7 sigan calcined, ion-exchanged water, dried at 130 ℃ 12 hours, 450 ℃ They were fired. 얻어진 ZSM-5의 SiO 2 /Al 2 O 3 는 97(몰비)이었다. The resulting ZSM-5 SiO 2 / Al 2 O 3 was 97 (mole ratio). 퓸드 실리카, 수산화알루미늄, 테트라프로필암모늄 브로마이드, 불화암모늄 및 탈 이온수를 이용하여, SiO 2 : Al 2 O 3 : TPABr : F － : H 2 O = 1 : 0.042 : 0.125 : 0.9 : 33(몰비. 실리카원 및 알루미나원은 산화물을 기준으로 한 몰비)으로 하고, 180℃에서 70시간 수열 합성하였다. Using a fumed silica, aluminum hydroxide, tetrapropyl ammonium bromide, ammonium fluoride, and deionized water, SiO 2: Al 2 O 3 : TPABr: F -:. H 2 O = 1: 0.042: 0.125: 0.9: 33 ( molar ratio of silica source and the alumina source is in a molar ratio, based on the oxide), which was synthesized in 70 hours sequence 180 ℃. 수열 합성 후, 얻어진 생성물을 물로 세정 여과하여, 130℃에서 12시간 건조 후, 550℃에서 7시간 소성 처리한 후, 이온 교환하고, 130℃에서 12시간 건조하고, 450℃에서 2시간 소성하였다. After the hydrothermal synthesis, the washed filter the resulting product with water, and after 12 hours drying at 130 ℃, then at 550 ℃ treatment seven hours calcination, ion exchange, and 12 hours and dried at 130 ℃ and calcined at 450 ℃ 2 hours. 얻어진 ZSM-5의 SiO 2 /Al 2 O 3 는 60(몰비)이고, 전 알루미늄 중의 골격 외 알루미늄의 비율은 0%였다. The resulting ZSM-5 SiO 2 / Al 2 O 3 was 60 (mole ratio), and the ratio of aluminum in the entire outer skeletal aluminum was 0%. 합성예 4에서 얻은 ZSM-5를 635 메시(20 ㎛)의 체를 이용하여 분급하여, 미분(微粉) ZSM-5를 얻었다. By classifying by the ZSM-5 obtained in Example 4 using a sieve of 635 mesh (20 ㎛), to obtain a fine powder (微粉) ZSM-5. 합성예 1에서 얻은 ZSM-5를, 550℃에서 2시간 소성 처리한 후, 이온 교환하고, 130℃에서 12시간 건조하고, 450℃에서 2시간 소성하였다. The ZSM-5 obtained in Synthesis Example 1, and then for 2 hours and baked at 550 ℃, ion-exchanged water for 12 hours and dried at 130 ℃ and calcined at 450 ℃ 2 hours. SiO 2 /Al 2 O 3 는 합성예 1과 마찬가지로 97(몰비)이었다. SiO 2 / Al 2 O 3 was 97 (mol ratio) In the same manner as in Synthesis Example 1. 합성예 4와 마찬가지의 처방 및 공정에 의해, 180℃에서 70시간의 수열 합성 처리 및 550℃에서 7시간의 소성 처리를 행한 후, 이온 교환 처리를 행하지 않고 얻어진 생성물을 25℃에서 이온 교환수를 이용하여 세정 여과하여, 130℃에서 12시간 건조 후, 550℃에서 7시간 소성 처리하였다. By the Synthesis Example 4 with the formulation and processing of the same, and then at 180 ℃ in the hydrothermal treatment and 550 ℃ for 70 hours was subjected to baking treatment for 7 hours, without performing an ion exchange treatment the ion exchange the resulting product at 25 ℃ by washing by filtration, and treated 12 hours after drying at 130 ℃, 7 sigan baked at 550 ℃. 얻어진 ZSM-5의 SiO 2 /Al 2 O 3 는 42(몰비)이고, 전 알루미늄 중의 골격 외 알루미늄의 비율은 42%였다. The resulting ZSM-5 SiO 2 / Al 2 O 3 was 42 (mole ratio), and the ratio of aluminum in the entire outer skeletal aluminum was 42%. 시판되고 있는 ZSM-5를 이용하였다. It was used for ZSM-5 in the market. SiO 2 /Al 2 O 3 는 49(몰비)였다. SiO 2 / Al 2 O 3 was 49 (mole ratio). 오르토규산 테트라에틸(TEOS), 테트라프로필암모늄 히드록시드(TPAOH), 에탄올(EtOH) 및 탈 이온수를 이용하여, SiO 2 : TPAOH : EtOH : H 2 O = 2 : 0.05 : 0.8 : 120(몰비)이 되도록 실리케이트 막 형성용 전구액을 조제하였다. Using the ortho-silicic acid tetraethyl (TEOS), tetrapropylammonium hydroxide (TPAOH), ethanol (EtOH) and deionized water, SiO 2: TPAOH: EtOH: H 2 O = 2: 0.05: 0.8: 120 ( molar ratio) It is to prepare a film-forming silicate solution bulb. 합성예 1에서 얻은 ZSM-5와 조제한 실리케이트 막 형성용 전구액을 혼합하고, 180℃에서 24시간 수열 합성을 행하였다. The ZSM-5 as prepared bulb silicate solution for film formation obtained in Synthesis Example 1 were mixed, and was subjected to hydrothermal synthesis for 24 hours at 180 ℃. 수열 합성 후, 얻어진 생성물을 25℃에서 이온 교환수를 이용하여 세정 여과하여, 130℃에서 12시간 건조 후, 550℃에서 5시간 소성 처리한 후, 이온 교환하고, 130℃에서 12시간 건조하고, 550℃에서 2시간 소성하여 실리케이트 피복 MFI형 제올라이트를 얻었다. After the hydrothermal synthesis, by filtration washed with ion-exchanged water and the resulting product at 25 ℃, after 12 hours drying at 130 ℃, after treatment 5 hours and baked at 550 ℃, and ion-exchanged water, dried at 130 ℃ 12 hours, in 550 ℃ 2 sigan firing to obtain a silicate coating MFI-type zeolite. 얻어진 실리케이트 피복 MFI형 제올라이트의 pKa 값은 ＋3.3 이상, 즉 pKa가 ＋3.3인 하메트 지시약을 변색하지 않았다. pKa value of the resultant silicate coated MFI-type zeolite, did not discolor to +3.3 or more, i.e., a pKa of +3.3 and an indicator meth. 오르토규산 테트라에틸(TEOS), 테트라프로필암모늄 히드록시드(TPAOH), 에탄올(EtOH) 및 탈 이온수를 이용하여, SiO 2 : TPAOH : EtOH : H 2 O = 2 : 0.05 : 0.8 : 120(몰비)이 되도록 실리케이트 막 형성용 전구액을 조제하였다. Using the ortho-silicic acid tetraethyl (TEOS), tetrapropylammonium hydroxide (TPAOH), ethanol (EtOH) and deionized water, SiO 2: TPAOH: EtOH: H 2 O = 2: 0.05: 0.8: 120 ( molar ratio) It is to prepare a film-forming silicate solution bulb. 합성예 2에서 얻은 ZSM-5와 조제한 실리케이트 막 형성용 전구액을 혼합하고, 180℃에서 24시간 수열 합성을 행하였다. The ZSM-5 as prepared bulb silicate solution for film formation obtained in Synthesis Example 2 were mixed, and was subjected to hydrothermal synthesis for 24 hours at 180 ℃. 수열 합성 후, 얻어진 생성물을 25℃에서 이온 교환수를 이용하여 세정 여과하여, 130℃에서 12시간 건조 후, 550℃에서 5시간 소성 처리하여 실리케이트 피복 MFI형 제올라이트를 얻었다. After the hydrothermal synthesis, by filtration washed with ion-exchanged water and the resulting product at 25 ℃, after 12 hours drying at 130 ℃, it treated 5 hours and baked at 550 ℃ to obtain a silicate coating MFI-type zeolite. 얻어진 실리케이트 피복 MFI형 제올라이트의 pKa 값은 ＋3.3 이상, 즉 pKa가 ＋3.3인 하메트 지시약을 변색하지 않았다. pKa value of the resultant silicate coated MFI-type zeolite, did not discolor to +3.3 or more, i.e., a pKa of +3.3 and an indicator meth. 오르토규산 테트라에틸(TEOS), 테트라프로필암모늄 히드록시드(TPAOH), 에탄올(EtOH) 및 탈 이온수를 이용하여, SiO 2 : TPAOH : EtOH : H 2 O = 2 : 0.05 : 0.8 : 120(몰비)이 되도록 실리케이트 막 형성용 전구액을 조제하였다. Using the ortho-silicic acid tetraethyl (TEOS), tetrapropylammonium hydroxide (TPAOH), ethanol (EtOH) and deionized water, SiO 2: TPAOH: EtOH: H 2 O = 2: 0.05: 0.8: 120 ( molar ratio) It is to prepare a film-forming silicate solution bulb. 합성예 3에서 얻은 ZSM-5와 조제한 실리케이트 막 형성용 전구액을 혼합하고, 180℃에서 24시간 수열 합성을 행하였다. The ZSM-5 as prepared bulb silicate solution for film formation obtained in Synthesis Example 3 were mixed, and was subjected to hydrothermal synthesis for 24 hours at 180 ℃. 수열 합성 후, 얻어진 생성물을 25℃에서 이온 교환수를 이용하여 세정 여과하여 건조 후, 550℃에서 5시간 소성 처리한 후, 이온 교환하고, 130℃에서 12시간 건조하고, 550℃에서 5시간 소성하여 실리케이트 피복 MFI형 제올라이트를 얻었다. After the hydrothermal synthesis, it was dried by filtration washed with ion-exchanged water and the resulting product at 25 ℃, after treatment 5 hours and baked at 550 ℃, ion-exchanged water, in 130 ℃ drying 12 hours, 5 hours and baked at 550 ℃ to give a silicate coating MFI-type zeolite. 얻어진 실리케이트 피복 MFI형 제올라이트의 pKa 값은 ＋3.3 이상, 즉 pKa가 ＋3.3인 하메트 지시약을 변색하지 않았다. pKa value of the resultant silicate coated MFI-type zeolite, did not discolor to +3.3 or more, i.e., a pKa of +3.3 and an indicator meth. 오르토규산 테트라에틸(TEOS), 테트라프로필암모늄 히드록시드(TPAOH), 에탄올(EtOH) 및 탈 이온수를 이용하여, SiO 2 : TPAOH : EtOH : H 2 O = 2 : 0.05 : 0.8 : 120(몰비)이 되도록 실리케이트 막 형성용 전구액을 조제하였다. Using the ortho-silicic acid tetraethyl (TEOS), tetrapropylammonium hydroxide (TPAOH), ethanol (EtOH) and deionized water, SiO 2: TPAOH: EtOH: H 2 O = 2: 0.05: 0.8: 120 ( molar ratio) It is to prepare a film-forming silicate solution bulb. 합성예 4에서 얻은 ZSM-5와 조제한 실리케이트 막 형성용 전구액을 혼합하고, 180℃에서 24시간 수열 합성을 행하였다. The ZSM-5 as prepared bulb silicate solution for film formation obtained in Synthesis Example 4 were mixed, and was subjected to hydrothermal synthesis for 24 hours at 180 ℃. 수열 합성 후, 얻어진 생성물을 25℃에서 이온 교환수를 이용하여 세정 여과하여, 130℃에서 12시간 건조 후, 550℃에서 5시간 소성 처리하여 실리케이트 피복 MFI형 제올라이트를 얻었다. After the hydrothermal synthesis, by filtration washed with ion-exchanged water and the resulting product at 25 ℃, after 12 hours drying at 130 ℃, it treated 5 hours and baked at 550 ℃ to obtain a silicate coating MFI-type zeolite. 얻어진 실리케이트 피복 MFI형 제올라이트의 pKa 값은 ＋3.3 이상, 즉 pKa가 ＋3.3인 하메트 지시약을 변색하지 않았다. pKa value of the resultant silicate coated MFI-type zeolite, did not discolor to +3.3 or more, i.e., a pKa of +3.3 and an indicator meth. 오르토규산 테트라에틸(TEOS), 테트라프로필암모늄 히드록시드(TPAOH), 에탄올(EtOH) 및 탈 이온수를 이용하여, SiO 2 : TPAOH : EtOH : H 2 O = 2 : 0.05 : 0.8 : 120(몰비)이 되도록 실리케이트 막 형성용 전구액을 조제하였다. Using the ortho-silicic acid tetraethyl (TEOS), tetrapropylammonium hydroxide (TPAOH), ethanol (EtOH) and deionized water, SiO 2: TPAOH: EtOH: H 2 O = 2: 0.05: 0.8: 120 ( molar ratio) It is to prepare a film-forming silicate solution bulb. 합성예 5에서 얻은 ZSM-5와 조제한 실리케이트 막 형성용 전구액을 혼합하고, 180℃에서 24시간 수열 합성을 행하였다. The ZSM-5 as prepared bulb silicate solution for film formation obtained in Synthesis Example 5 were mixed, and was subjected to hydrothermal synthesis for 24 hours at 180 ℃. 수열 합성 후, 얻어진 생성물을 25℃에서 이온 교환수를 이용하여 세정 여과하여, 130℃에서 12시간 건조 후, 550℃에서 5시간 소성 처리하여 실리케이트 피복 MFI형 제올라이트를 얻었다. After the hydrothermal synthesis, by filtration washed with ion-exchanged water and the resulting product at 25 ℃, after 12 hours drying at 130 ℃, it treated 5 hours and baked at 550 ℃ to obtain a silicate coating MFI-type zeolite. 얻어진 실리케이트 피복 MFI형 제올라이트의 pKa 값은 ＋3.3 이상, 즉 pKa가 ＋3.3인 하메트 지시약을 변색하지 않았다. pKa value of the resultant silicate coated MFI-type zeolite, did not discolor to +3.3 or more, i.e., a pKa of +3.3 and an indicator meth. 오르토규산 테트라에틸(TEOS), 테트라프로필암모늄 히드록시드(TPAOH), 에탄올(EtOH) 및 탈 이온수를 이용하여, SiO 2 : TPAOH : EtOH : H 2 O = 2 : 0.05 : 0.8 : 120(몰비)이 되도록 실리케이트 막 형성용 전구액을 조제하였다. Using the ortho-silicic acid tetraethyl (TEOS), tetrapropylammonium hydroxide (TPAOH), ethanol (EtOH) and deionized water, SiO 2: TPAOH: EtOH: H 2 O = 2: 0.05: 0.8: 120 ( molar ratio) It is to prepare a film-forming silicate solution bulb. 합성예 6에서 얻은 ZSM-5와 조제한 실리케이트 막 형성용 전구액을 혼합하고, 180℃에서 24시간 수열 합성을 행하였다. The ZSM-5 as prepared bulb silicate solution for film formation obtained in Synthesis Example 6 were mixed, and was subjected to hydrothermal synthesis for 24 hours at 180 ℃. 수열 합성 후, 얻어진 생성물을 25℃에서 이온 교환수를 이용하여 세정 여과하여, 130℃에서 12시간 건조 후, 550℃에서 5시간 소성 처리하여 실리케이트 피복 MFI형 제올라이트를 얻었다. After the hydrothermal synthesis, by filtration washed with ion-exchanged water and the resulting product at 25 ℃, after 12 hours drying at 130 ℃, it treated 5 hours and baked at 550 ℃ to obtain a silicate coating MFI-type zeolite. 얻어진 실리케이트 피복 MFI형 제올라이트의 pKa 값은 －3.0 이상 ＋1.5 이하, 즉 pKa가 ＋1.5인 하메트 지시약을 변색하고, －3.0인 하메트 지시약을 변색하지 않았다. Resultant silicate coated pKa value of the MFI-type zeolite, and the color change of +1.5 or less -3.0 or more, that is, the pKa +1.5 and an indicator meth, did not discolor to -3.0 and a meth indicator. 오르토규산 테트라에틸(TEOS), 테트라프로필암모늄 히드록시드(TPAOH), 에탄올(EtOH) 및 탈 이온수를 이용하여, SiO 2 : TPAOH : EtOH : H 2 O = 2 : 0.05 : 0.8 : 120(몰비)이 되도록 실리케이트 막 형성용 전구액을 조제하였다. Using the ortho-silicic acid tetraethyl (TEOS), tetrapropylammonium hydroxide (TPAOH), ethanol (EtOH) and deionized water, SiO 2: TPAOH: EtOH: H 2 O = 2: 0.05: 0.8: 120 ( molar ratio) It is to prepare a film-forming silicate solution bulb. 시판 ZSM-5와 조제한 실리케이트 막 형성용 전구액을 혼합하고, 180℃에서 24시간 수열 합성을 행하였다. A commercially available ZSM-5 as prepared bulb silicate solution for film-forming mixture and subjected to hydrothermal synthesis for 24 hours at 180 ℃. 수열 합성 후, 얻어진 생성물을 25℃에서 이온 교환수를 이용하여 세정 여과하여, 130℃에서 12시간 건조 후, 550℃에서 5시간 소성 처리하여 실리케이트 피복 MFI형 제올라이트를 얻었다. After the hydrothermal synthesis, by filtration washed with ion-exchanged water and the resulting product at 25 ℃, after 12 hours drying at 130 ℃, it treated 5 hours and baked at 550 ℃ to obtain a silicate coating MFI-type zeolite. 얻어진 실리케이트 피복 MFI형 제올라이트의 pKa 값은 －5.6 이상 －3.0 이하, 즉 pKa가 －3.0인 하메트 지시약을 변색하고, －5.6인 하메트 지시약을 변색하지 않았다. Resultant silicate coated pKa value of the MFI-type zeolite, and the color change is more than -5.6 -3.0 or less, that is, with a pKa of -3.0 meth indicator, did not discolor to -5.6 and a meth indicator. 오르토규산 테트라에틸(TEOS), 테트라프로필암모늄 히드록시드(TPAOH), 에탄올(EtOH) 및 탈 이온수를 이용하여, SiO 2 : TPAOH : EtOH : H 2 O = 2 : 0.05 : 0.8 : 120(몰비)이 되도록 실리케이트 막 형성용 전구액을 조제하였다. Using the ortho-silicic acid tetraethyl (TEOS), tetrapropylammonium hydroxide (TPAOH), ethanol (EtOH) and deionized water, SiO 2: TPAOH: EtOH: H 2 O = 2: 0.05: 0.8: 120 ( molar ratio) It is to prepare a film-forming silicate solution bulb. 합성예 7에서 얻은 ZSM-5와 조제한 실리케이트 막 형성용 전구액을 혼합하고, 180℃에서 24시간 수열 합성을 행하였다. The ZSM-5 as prepared bulb silicate solution for film formation obtained in Synthesis Example 7 were mixed, and was subjected to hydrothermal synthesis for 24 hours at 180 ℃. 수열 합성 후, 얻어진 생성물을 25℃에서 이온 교환수를 이용하여 세정 여과하여, 130℃에서 12시간 건조 후, 550℃에서 5시간 소성 처리하여 실리케이트 피복 MFI형 제올라이트를 얻었다. After the hydrothermal synthesis, by filtration washed with ion-exchanged water and the resulting product at 25 ℃, after 12 hours drying at 130 ℃, it treated 5 hours and baked at 550 ℃ to obtain a silicate coating MFI-type zeolite. 얻어진 실리케이트 피복 MFI형 제올라이트의 pKa 값은 －3.0 이상 ＋1.5 이하, 즉 pKa가 ＋1.5인 하메트 지시약을 변색하고, －3.0인 하메트 지시약을 변색하지 않았다. Resultant silicate coated pKa value of the MFI-type zeolite, and the color change of +1.5 or less -3.0 or more, that is, the pKa +1.5 and an indicator meth, did not discolor to -3.0 and a meth indicator. 상기와 같이 하여 얻은 합성예 1∼7, 시판 ZSM-5, 실시예 1∼5 및 비교예 1∼3의 촉매에 대하여, X선에 의하여 결정 구조를 해석하였다. With respect to the synthesis example 1 to 7, a commercially available ZSM-5, Examples 1 to 5 and the catalyst of Comparative Examples 1 to 3 obtained as described above was analyzed for crystalline structure by X-ray. 도 2∼8에 합성예 1∼7, 도 9에 시판 ZSM-5, 도 10∼14에 실시예 1∼5, 도 15∼도 17에 비교예 1∼3와 관련된 ZSM-5형 제올라이트 촉매의 X선 회절도를 나타낸다. Synthetic Example 2-8 to 1-7, commercially available ZSM-5 in Fig. 9, in the embodiment 1-5, Fig. 15~ Fig. 17 ZSM-5 and Comparative Examples 1 to 3 related to type zeolite to 10 to 14 X-ray shows the diffraction pattern. X선 회절 스펙트럼을 취득할 때의 분석 조건은 아래와 같다. Analysis conditions at the time of obtaining the X-ray diffraction spectrum are as follows. 또, 실시예 1∼5 및 비교예 1∼3에 대해서는, 취득한 X선 회절도로부터, 결정화도, 결정자 직경, X선 회절 스펙트럼의 7.0∼8.4°에 있는 피크 a 면적과, X선 회절 스펙트럼의 8.4∼9.7°에 있는 피크 b 면적, 및 피크 면적비 b/ａ를 구하였다. In addition, Examples 1 to 5 and Comparative Examples 1 to 3 for the, obtained from the X-ray diffraction chart, crystallinity, crystallite size, X-ray peak at 7.0~8.4 ° of the diffraction pattern and a surface area, an X-ray diffraction spectrum of the 8.4 It was obtained the peak area b, and the peak area ratio b / a in the ~9.7 °. 합성예 1∼7 및 시판 ZSM-5에 대해서는 결정화도, 결정자 직경, X선 회절 스펙트럼의 7.0∼8.4°에 있는 피크 a' 면적과, X선 회절 스펙트럼의 8.4∼9.7°에 있는 피크 b' 면적, 및 피크 면적비 b'/a'를 구하였다. For the Synthesis Example 1-7 and commercially available ZSM-5 crystallinity, crystallite size, X-ray peak at 7.0~8.4 a ° of the diffraction spectrum, the area, X-ray peak at 8.4~9.7 b ° of the diffraction spectrum, the area, and the peak area ratio was determined b '/ a'. 또, 상기 합성예, 실시예, 및 비교예에 대하여, 29 Al-NMR에 의하여 골격 내 알루미늄(골격 내 Al)의 비율, 골격 내 SiO 2 /Al 2 O 3 비를 구함과 함께, 레이저 회절식의 입도 분포 측정 장치에 의하여 입자경을 측정하였다. Further, the above Synthesis Example, Examples, and with respect to the comparative example, the 29 skeletal within aluminum by Al-NMR ratio of the (backbone in Al), skeleton in SiO 2 / Al 2 O 3 ratio of with wanted, laser diffraction the particle size was measured by a particle size distribution measuring apparatus of. 결과를 표 2에 나타낸다. The results are shown in Table 2. 또한, 본원에 있어서, 골격 내 알루미늄이란 29 Al-NMR에 의하여 측정된 4 배위 알루미늄을 말하고, 골격 외 알루미늄이란 29 Al-NMR에 의하여 측정된 6 배위 알루미늄을 말한다. Further, in the present application, within the framework aluminum is to say the four coordinated aluminum measured by the 29 Al-NMR, the outer aluminum skeleton means a 6 coordination of aluminum measured by the 29 Al-NMR. 따라서, 상기 골격 내 알루미늄의 비율이란 29 Al-NMR 스펙트럼으로부터 산출된 4 배위 및 6 배위 알루미늄의 합에 대한 4 배위 알루미늄의 비율을 말한다. Thus, the ratio of the framework aluminum refers to the ratio of 4-coordination aluminum to the sum of 4 and 6 coordination coordinated aluminum was determined from the 29 Al-NMR spectrum. 또, 입자경은, 체적 기준의 입도 분포에 있어서의 모드 직경(최빈도 직경)이다. The particle size is a mode diameter (modal FIG diameter) of the particle size distribution based on volume. 결정화도는 NE CHEMCAT사 제의 ZSM-5(SiO 2 /Al 2 O 3 = 30)를 600℃에서 5시간 소성한 것의 (101)면의 강도와 각 제올라이트의 (101)면의 강도의 비로부터 산출하였다(계산식은 이하와 같음). Crystallinity NE CHEMCAT Corporation of ZSM-5 (SiO 2 / Al 2 O 3 = 30) of from 600 ℃ 5 hours of strength and each zeolite in 101 of what a side firing 101, calculated from the intensity of the surface ratio It was (formula is as follows). 결정자 직경은 (101)면의 값이다. Crystallite size is a value of the surface 101. 도 2∼도 6 및 표 2에 나타낸 바와 같이, 합성예 1∼5는 X선 회절도의 7.0∼8.4°에 있는 피크 a' 면적과, 8.4∼9.7°에 있는 피크 b' 면적의 피크 면적비 b'/a'는 1 이상(2.3, 9.6, 1.4, 1.4, 1.2)이라는 것을 알 수 있었다. As shown in Fig. 2 to Fig. 6 and Table 2, Synthetic Example 1 to 5 peaks in the X-ray diffraction chart of 7.0~8.4 ° a 'area and a peak in the 8.4~9.7 ° b' area of ​​the peak area ratio b '/ a' was found to be of one or more (2.3, 9.6, 1.4, 1.4, 1.2). 이에 비하여, 도 7 및 9에 나타낸 바와 같이, 합성예 6 및 시판 ZSM-5의 피크 면적비 b'/a'는 0.8, 0.9로 1보다 작아, 명백하게 ZSM-5의 발달한 결정면이 합성예 1∼5와는 다르다는 것을 알 수 있다. In contrast, as shown in Figures 7 and 9, in Synthesis Example 6 and commercially available ZSM-5 peak area ratio b '/ a' is 0.8 to 0.9 lower than 1, obviously synthesis is a developed crystal faces of the ZSM-5 Example 1 to 5 than can be seen that different. 도 8 및 표 2에 나타낸 바와 같이, 소성 처리 후 이온 교환을 행하지 않고 물로 세정한 합성예 7은, 피크 면적비 b'/a'는 1 이상이나, 골격 내 알루미늄의 비율이 작다(58%), 즉, 골격 외 알루미늄이 많이 존재한다(42%)는 것을 알 수 있었다. As shown in Figure 8 and Table 2, after the firing process a composite washing without performing an ion exchange water, Example 7, and the peak area ratio b '/ a' is small is more than 1 and the scaffold ratio of aluminum (58%), that is, the aluminum outer skeleton there are many (42%) was found to be. 또한, 도 10∼14 및 표 2에 나타낸 바와 같이, 실시예 1∼5는 X선 회절도의 7.0∼8.4°에 있는 피크 a 면적과, 8.4∼9.7°에 있는 피크 b 면적의 피크 면적비 b/a는 1 이상(1.4, 1.9, 1.2, 1.1, 1.4)임과 함께, pKa 값은 ＋3.3 이상이라는 것을 알 수 있었다. In addition, as shown in Fig. 10 to 14 and Table 2, Examples 1 to 5 are X-ray peak area b in 7.0~8.4 ° peak a area and, 8.4~9.7 ° in a diffraction peak area ratio b / a is, pKa value with one or more (1.4, 1.9, 1.2, 1.1, 1.4) being it was found that more than +3.3. 이에 비하여, 비교예 1 및 2의 피크 면적비 b/a는, 도 15 및 16에 나타낸 바와 같이, 0.8, 0.9로 1보다 작아, 명백하게 실리케이트 피복 후의 ZSM-5의 발달한 결정면이 실시예 1∼5와는 다르다는 것을 알 수 있다. Thus, Comparative Example 1 and as shown in Fig. 2 of the peak area ratio b / a is 15 and 16, 0.8, 0.9 to less than 1, obviously the one developed crystal faces of the ZSM-5 after the silicate coating Examples 1 to 5 than than it can be seen that different. 또, 도 17 및 표 2에 나타낸 바와 같이, 비교예 3은, 피크 면적비 b/a는 1 이상이나, pKa 값이 －3.0∼＋1.5라는 것을 알 수 있었다. In addition, as shown in Fig. 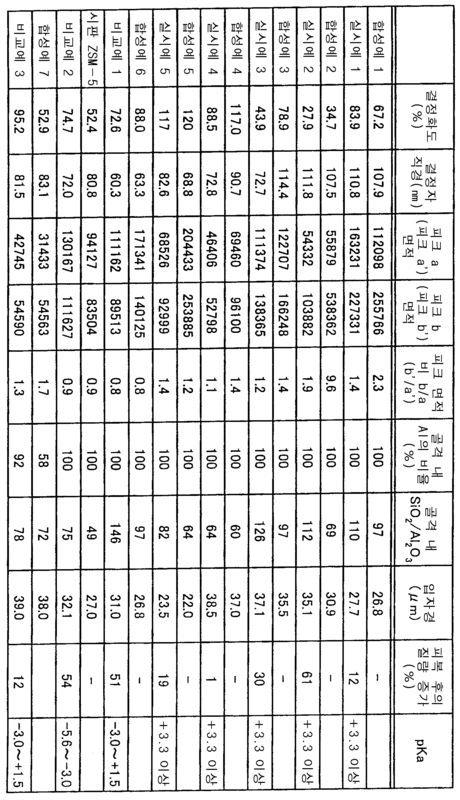 17 and Table 2, Comparative Example 3, the peak area ratio b / a was found to be 1 or more or, pKa value of -3.0~ + 1.5. 또, 이온 교환 처리를 행하지 않고 물 세정을 행한 비교예 3은, 골격 내 알루미늄의 비율이 100%는 아니다(92%), 즉, 골격 외 알루미늄이 존재한다(8%)는 것을 알 수 있었다. In addition, comparison subjected to water washing without performing an ion exchange treatment Example 3, the ratio of aluminum skeleton 100% It was found that it is not (92%), that is, the aluminum outer skeleton presence (8%). 합성예 1∼3 및 6, 시판 ZSM-5, 실시예 1∼3, 및 비교예 1 및 2의 MFI형 제올라이트 및 실리케이트 피복 MFI형 제올라이트의 존재 하에서, 톨루엔의 불균화 반응을 행하고, 톨루엔의 전화율 및 p-크실렌의 선택률을 측정하였다. Synthesis Examples 1 to 3 and 6, a commercially available ZSM-5, Examples 1 to 3 and Comparative Examples 1 and 2 MFI-type zeolite and silicate coating in the presence of an MFI-type zeolite, subjected to disproportionation reaction of toluene, the conversion of toluene of and the selectivity of p- xylene was measured. 고정층 반응 용기에 20 ㎎의 MFI형 제올라이트 또는 실리케이트 피복 MFI형 제올라이트를 충전하고, 수소/톨루엔을 60 mol/mol로 하여, LHSV를 0.48 h -1 , 0.9 MPaG, 400℃에서 불균화 반응을 행하였다. To the 20 ㎎ of MFI-type zeolite or silicate coating MFI-type zeolite charged, and hydrogen / toluene in a fixed bed reaction vessel was 60 mol / mol, it was subjected to a disproportionation reaction at a LHSV 0.48 h -1, 0.9 MPaG, 400 ℃ . 반응 용기 출구의 생성물을 가스 크로마토그래피에 의하여 분석하고, 톨루엔의 전화율 및 p-크실렌의 선택률을 구하였다. By the product of the reaction vessel outlet to a gas chromatography analysis, the conversion and the selectivity were determined in the p- xylene and toluene. 또한, 톨루엔 전화율 및 p-크실렌 선택률은 이하의 식에 의하여 산출하였다. Further, the toluene conversion and p- xylene selectivity was calculated by the following equation. 하기의 표 3에, 촉매 성능 평가 시험의 결과를 pKa 값과 함께 나타낸다. In Table 3, it shows the results of the catalytic performance evaluation test with a pKa value. 표 3에 나타낸 바와 같이, 본 발명에 관련된 실리케이트 피복 MFI형 제올라이트를 이용한 실시예 1∼3에서는, 실리케이트 피복 전의 합성예 1∼3의 전화율을 유지하면서(4∼5% 정도), p-크실렌의 선택률을 대폭 향상할 수 있다는 것을 알 수 있었다. As shown in Table 3, in Examples 1 to 3 using a silicate coating MFI-type zeolite of the present invention, silicate while maintaining the conversion rate of synthetic Examples 1 to 3 before covering (approximately 4-5%), of the p- xylene it was found that it is possible to significantly improve the selectivity. 한편, 본 발명을 만족시키지 않는 실리케이트 피복 MFI형 제올라이트를 이용한 비교예 1 및 2는, 실리케이트 피복 전의 합성예 6 및 시판 ZSM-5보다 전화율이 뒤떨어짐과 동시에, p-크실렌의 선택률도 향상할 수 없다는 것을 알 수 있다. On the other hand, Comparative Examples 1 and 2 using a silicate coating MFI-type zeolite which does not satisfy the present invention, simultaneously with the silicate in Synthesis Example 6, and the degree of conversion falls back than commercially available ZSM-5 before covering, the selectivity of p- xylene can also improve it can be seen that there is. 실시예 2, 4, 5 및 비교예 3의 실리케이트 피복 MFI형 제올라이트의 존재 하에서, 톨루엔의 불균화 반응을 행하고, 톨루엔의 전화율 및 p-크실렌의 선택률을 측정하였다. Example 2, in the presence of 4 and 5 and Comparative Examples 3 silicate coating of the MFI-type zeolite, subjected to disproportionation reaction of toluene, was measured for the conversion and the selectivity of p- xylene and toluene. 고정층 반응 용기에 0.5 g의 실리케이트 피복 MFI형 제올라이트를 충전하고, 수소/톨루엔을 1.0 mol/mol로 하여, LHSV를 6.0 h -1 , 상압(常壓), 500℃에서 불균화 반응을 행하였다. Charging a 0.5 g of a silicate coating MFI-type zeolite in a fixed bed reaction vessel, and the hydrogen / toluene to 1.0 mol / mol, to LHSV 6.0 h -1, and pressure (常壓), was subjected to a disproportionation reaction at 500 ℃. 반응 용기 출구의 생성물을 가스 크로마토그래피에 의하여 분석하고, 톨루엔의 전화율 및 p-크실렌의 선택률을 구하였다. By the product of the reaction vessel outlet to a gas chromatography analysis, the conversion and the selectivity were determined in the p- xylene and toluene. 표 4에 나타낸 바와 같이, 실리케이트 피복 전에 이온 교환 처리를 행하고, 골격 외 알루미늄이 0%인 실리케이트 피복 MFI형 제올라이트를 촉매로서 사용한 실시예 4는, 물로 세정 처리하고, 골격 외 알루미늄이 8%인 실리케이트 피복 MFI형 제올라이트를 촉매로서 사용한 비교예 3보다, p-크실렌 선택률이 높아진다는 것을 알 수 있었다. As shown in Table 4, and subjected to ion exchange treatment prior to the silicate coating, it performed using the skeleton outer aluminum 0% of silicate-coated MFI-type zeolite as a catalyst for example 4 is treated with water washing, and the skeleton outer aluminum 8% Silicate coating than Comparative example 3 using a MFI type zeolite as a catalyst, it was found that the higher p- xylene selectivity. 또, 입자경이 작은 실리케이트 피복 MFI형 제올라이트를 촉매로서 사용한 실시예 5는, 입자경이 큰 실리케이트 피복 MFI형 제올라이트를 촉매로서 사용한 실시예 4보다, p-크실렌 선택률을 유지하면서 톨루엔 전화율이 향상한다는 것을 알 수 있었다. The particle size is carried out using a small coated silicate MFI-type zeolite as the catalyst in Example 5, the particle size is large silicate coating MFI-type zeolite to see that more than in Example 4 using as catalyst, a toluene conversion rate is improved while maintaining the p- xylene selectivity could. 이상으로 설명한 바와 같이, 본 발명에 관련된 실리케이트 피복 MFI형 제올라이트, 및 실리케이트 피복 MFI형 제올라이트의 제조 방법은, 공업적으로 실시 가능한 형태가 되어 있어, 방향족 탄화수소(특히는 톨루엔)의 불균화 반응 또는 알킬화 반응에 의한 p-크실렌의 제조에 유용하다. As described above, the silicate coating MFI-type zeolite, and silicate-coated preparation of MFI-type zeolite of the present invention, there is an embodiment possible forms industrially, disproportionation reaction or transalkylation of an aromatic hydrocarbon (particularly toluene) it is useful for the production of p- xylene by the reaction. MFI형 제올라이트를 실리케이트로 피복한 실리케이트 피복 MFI형 제올라이트로서, 상기 실리케이트 피복 MFI형 제올라이트의 X선 회절 스펙트럼에 있어서, 2θ = 7.0∼8.4°에 있는 피크 a와, 2θ = 8.4∼9.7°에 있는 피크 b의 피크 면적비 b/a가 1 이상이고, 상기 실리케이트 피복 MFI형 제올라이트의 입자경이 1 ㎛ 이상 40 ㎛ 이하이며, 또한, 상기 MFI형 제올라이트의 세공 내에 들어가지 않는 크기의 하메트 지시약에 의하여 측정된 pKa 값이 ＋3.3 이상인 것을 특징으로 하는 실리케이트 피복 MFI형 제올라이트. As a silicate coating covering the MFI-type zeolite MFI-type zeolite as a silicate, the X-ray diffraction spectrum of the silicate coating MFI-type zeolite, and the peak 2θ = a in 7.0~8.4 °, 2θ = peak in 8.4~9.7 ° b and the peak area ratio b / a is more than 1, wherein the silicate coating and the particle size of the MFI-type zeolite is less than 1 ㎛ than 40 ㎛, also, determined by doing meth indicator that does not enter the size into the pores of the MFI-type zeolite silicate coating MFI-type zeolite, characterized in that a pKa value less than the +3.3. 상기 MFI형 제올라이트의 X선 회절 스펙트럼에 있어서, 2θ = 7.0∼8.4°에 있는 피크 a'와, 2θ = 8.4∼9.7°에 있는 피크 b'의 피크 면적비 b'/a'가 1 이상인 것을 특징으로 하는 실리케이트 피복 MFI형 제올라이트. The X-ray diffraction spectrum of the MFI-type zeolite, characterized in that a peak in the 2θ = 7.0~8.4 ° peak area ratio of "a, b in the peak 2θ = 8.4~9.7 ° 'b' / a 'is 1 or more silicate coating MFI-type zeolite. 상기 MFI형 제올라이트의 골격 외의 알루미늄 양은 10% 이하인 것을 특징으로 하는 실리케이트 피복 MFI형 제올라이트. Silicate coating MFI-type zeolite, the amount of aluminum outside the skeleton of the MFI-type zeolite characterized in that 10% or less. p-크실렌을 선택적으로 제조하기 위하여 이용하는 것을 특징으로 하는 실리케이트 피복 MFI형 제올라이트. Silicate coating MFI-type zeolite characterized by using to selective production of p- xylene. 제 1 항 내지 제 3 항 및 제 5 항 중 어느 한 항에 기재된 실리케이트 피복 MFI형 제올라이트를 제조하는 방법으로서, 2θ = 7.0∼8.4°에 있는 피크 a'와, 2θ = 8.4∼9.7°에 있는 피크 b'의 피크 면적비 b'/a'가 1 이상인 MFI형 제올라이트를, 실리카원 및 구조 규정제를 이용하여 수열 합성 처리하여, 상기 MFI형 제올라이트의 외표면에 실리케이트를 성장시키는 것을 특징으로 하는 실리케이트 피복 MFI형 제올라이트의 제조 방법. Claim 1 to claim 3 and claim 5 in a method for producing a silicate coating MFI-type zeolite according to any one of the preceding, 2θ = peak in 7.0~8.4 ° a 'and, 2θ = peak in 8.4~9.7 ° b 'peak area ratio of b' / a 'is 1 or more MFI-type zeolite to, the hydrothermal synthesis process using the silica source and structure defined claim, silicate coating, comprising a step of growing a silicate on the outer surface of the MFI-type zeolite process for producing a MFI-type zeolite. 상기 MFI형 제올라이트가, 실리카원과 알루미늄원과 구조 규정제와 불소원을 이용하여 수열 합성 처리하여 얻어지는 것을 특징으로 하는 실리케이트 피복 MFI형 제올라이트의 제조 방법. The method for producing a MFI-type zeolite, a silica source and an aluminum source and a silicate coating MFI type zeolite structures using the provisions of the fluoride source, characterized in that obtained by hydrothermal synthesis process. 상기 MFI형 제올라이트의 골격 외 알루미늄의 제거 공정을 갖는 것을 특징으로 하는 실리케이트 피복 MFI형 제올라이트의 제조 방법. Method for producing a silicate coating MFI-type zeolite which is characterized by having a removal step of the outer framework aluminum of the MFI-type zeolite. 제 1 항 내지 제 3 항 및 제 5 항 중 어느 한 항에 기재된 실리케이트 피복 MFI형 제올라이트와 방향족 탄화수소를 접촉시켜, 불균화 반응 또는 알킬화 반응을 행함으로써, p-크실렌을 선택적으로 제조시키는 것을 특징으로 하는 p-크실렌의 제조 방법. First by making to claim 3 and claim 5 is brought into contact with a silicate coating MFI type zeolite and an aromatic hydrocarbon as set forth in any one of claims, wherein the disproportionation reaction or an alkylation reaction, characterized by selective production of p- xylene the method of p- xylene to.